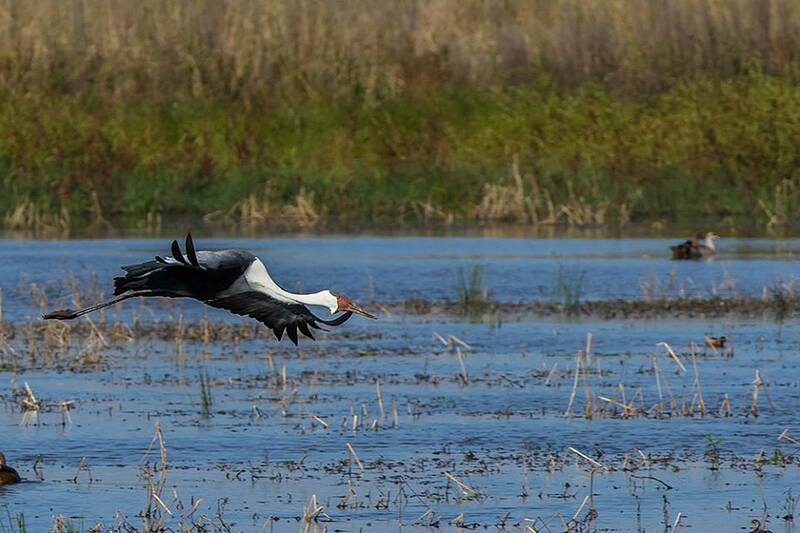 When Twané gave me her personal list of sightings, she said that she had seen 14 Wattled Cranes on April the first. I thought this was her idea of an April Fool’s, but she was being serious! 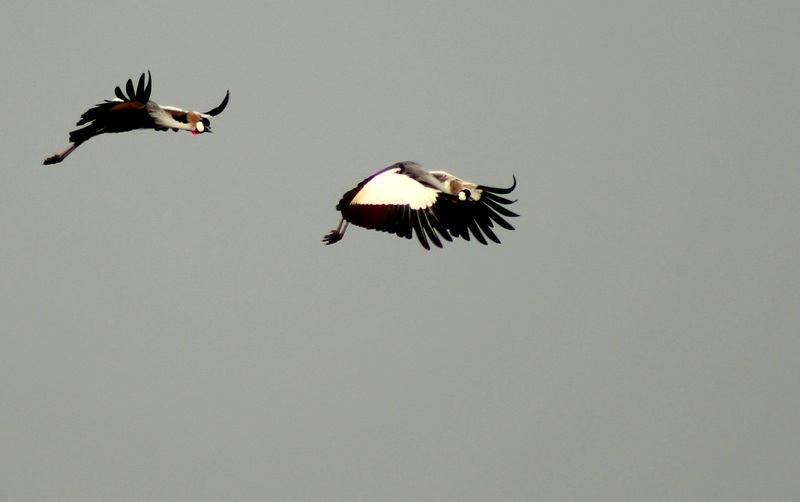 Pairs of Grey Crowned Cranes have been hanging around the Loskop Hide, but their nest building appears to have come to an end. 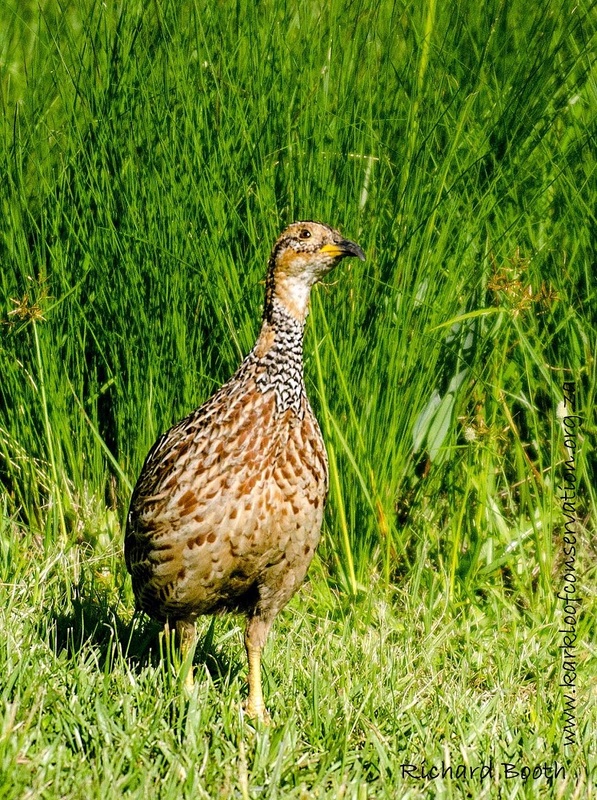 I recently saw a Natal Spurfowl (aka Natal Francolin before the taxonomists started messing with our glossaries) and several visitors have reported them during the month. 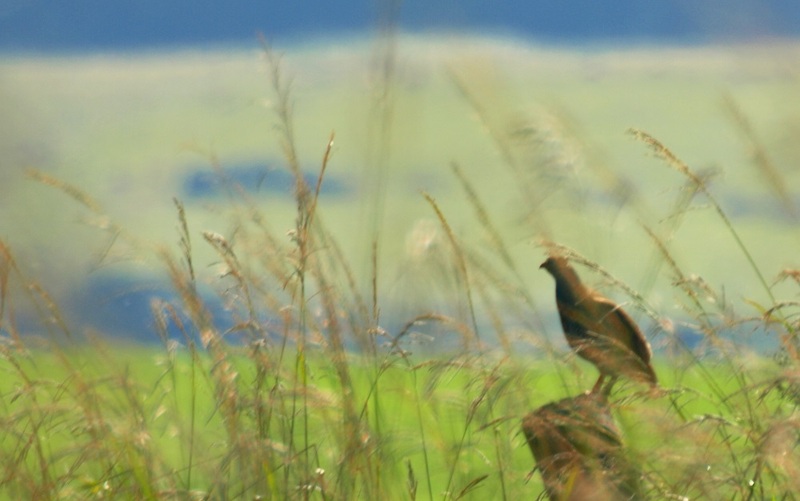 Many visitors have reported regular sightings of Black-winged Lapwings and Malachite Kingfishers, whilst a pair of African Jacana appear to have taken up squatters rights on the Loskop Pan. 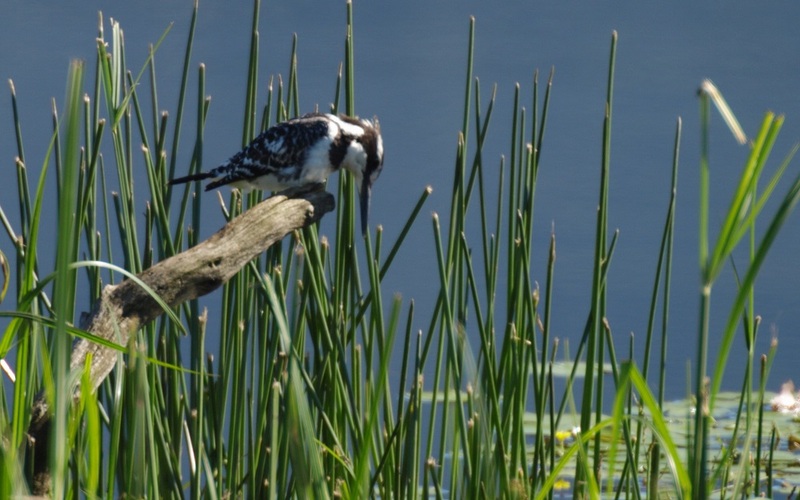 A Pied Kingfisher was spotted recently saying grace before taking the plunge to get lunch. Southern Red Bishop, Dark-capped Bulbul, Forest Buzzard, Jackal Buzzard, Yellow-fronted Canary, Familiar Chat, Levaillant’s Cisticola, Zitting Cisticola, Red-knobbed Coot, Reed Cormorant, White-breasted Cormorant, Black Crake, Blue Crane, Cape Crow, Pied Crow, African Darter, Cape Turtle-Dove, Red-eyed Dove, Fork-tailed Drongo, White-faced Duck, Yellow-billed Duck, African Fish-Eagle, Long-crested Eagle, Great Egret, Yellow-billed Egret, Common Fiscal, Southern Black Flycatcher, Egyptian Goose, Spur-winged Goose, Little Grebe, Helmeted Guineafowl, Hamerkop, African Marsh-Harrier, Black-headed Heron, Grey Heron, Purple Heron, African Sacred Ibis, Hededa Ibis, Southern Bald Ibis, Giant Kingfisher, Black-shouldered Kite, African Wattled Lapwing, Blacksmith Lapwing, Brown-throated Martin, Common Moorhen, Barn Owl, African Olive Pigeon, Speckled Pigeon, Three-banded Plover, Drakensberg Prinia, Red-billed Quelea, African Rail, Cape Robin-Chat, Secretarybird, South African Shelduck, Cape Shoveler, African Snipe, Southern Grey-headed Sparrow, African Spoonbill, African Stonechat, White Stork, Amethyst Sunbird, Barn Swallow, White-throated Swallow, Hottentot Teal, Red-billed Teal, Cape Wagtail, Common Waxbill, Village Weaver, Pin-tailed Whydah, Fan-tailed Widowbird, and Cardinal Woodpecker. 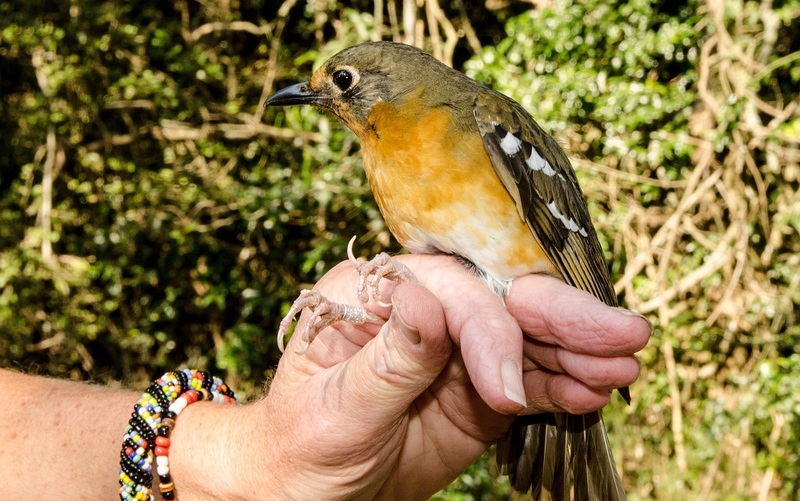 I was recently privileged to do some bird ringing in Mbona Private Nature Reserve upon invitation by Richard Booth. 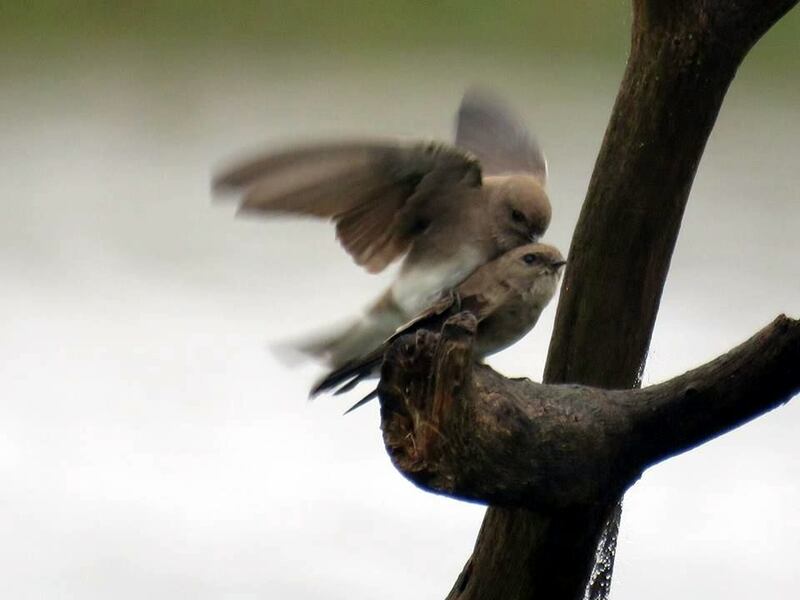 Forest edge birding is always very special, as you never know what you may catch. This day being no exception! Bush Blackcap, Orange Ground-Thrush, Barratt’s Warbler, Lemon Dove, Cape Batis, Forest Canary, White-starred Robin, Swee Waxbill, Sombre Greenbul and Dark-backed Weaver. A great ringing morning for me with 2 species that I’d never ringed before. 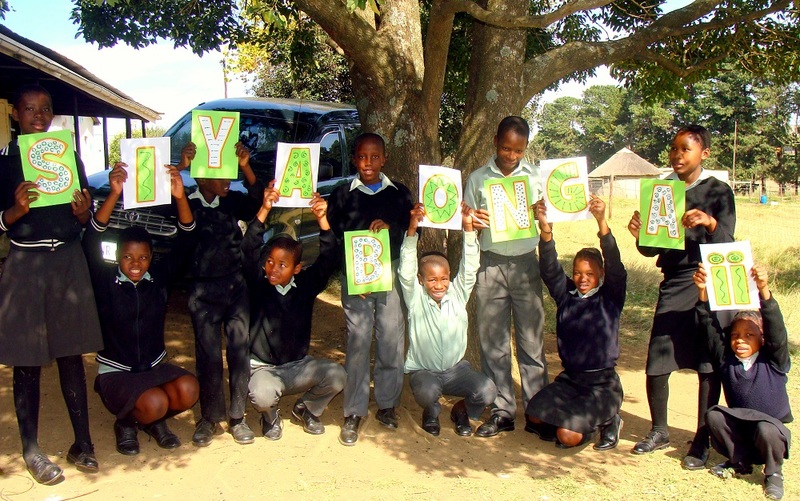 It was also good to meet some of the Mbona residents who came to see what bird ringing is about. We plan to have further ringing sessions, possibly once a season at Mbona. Thanks to Richard for the invite and a great morning. 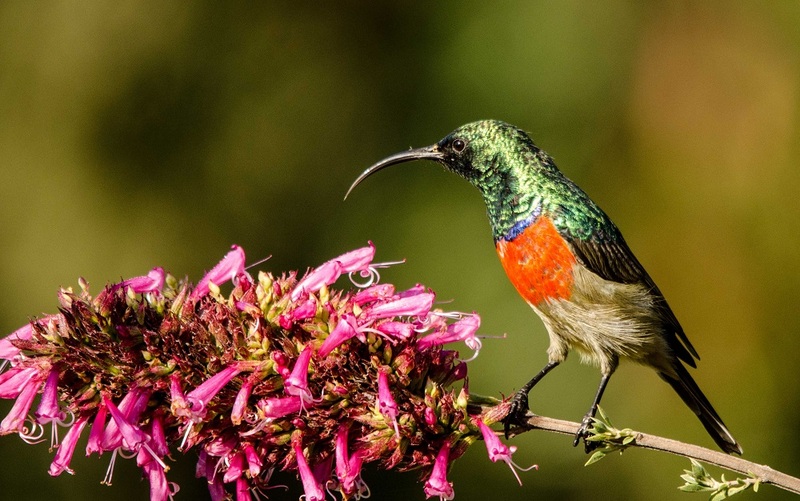 The Greater Double-collared Sunbirds are in our garden where they spend much of the day feeding in the Pink Plumes (Syncolostemon densiflorus) which are in bloom, a real favourite of theirs. 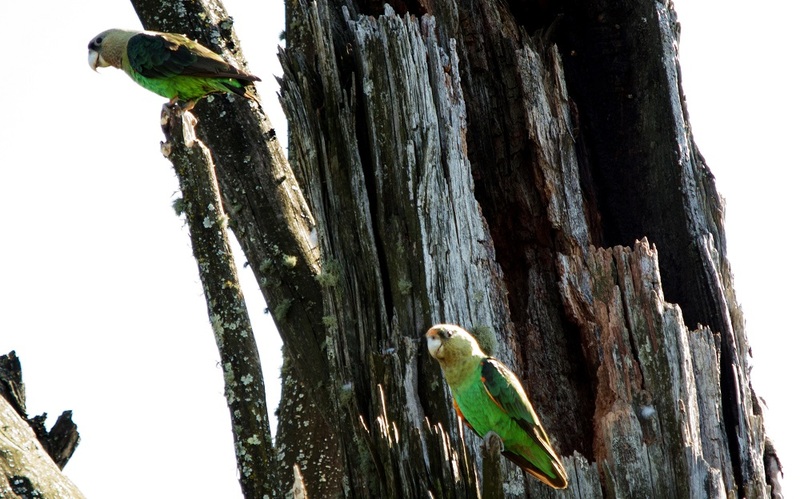 Some happy news from Mbona is that we have a pair of Cape Parrots nesting high up in a dead eucalyptus tree on our Reserve. 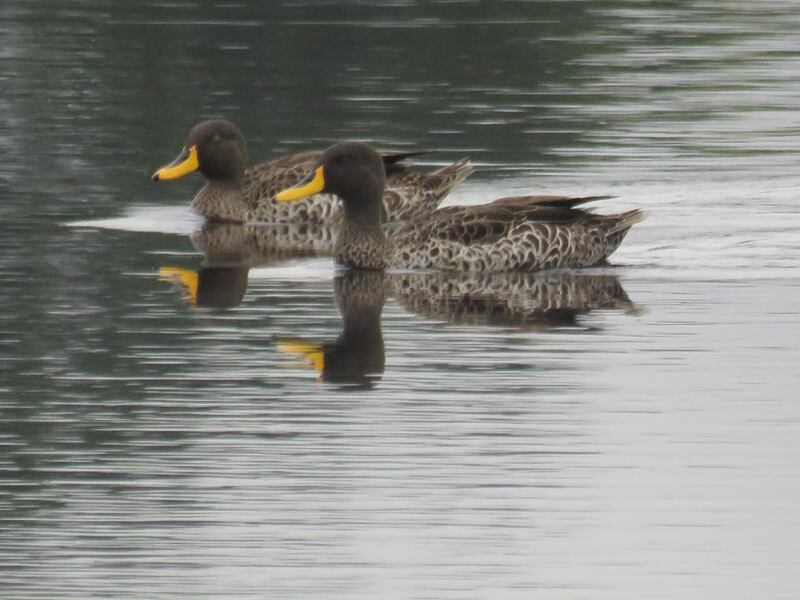 We first discovered them in April and were then seen regularly at the site during May. 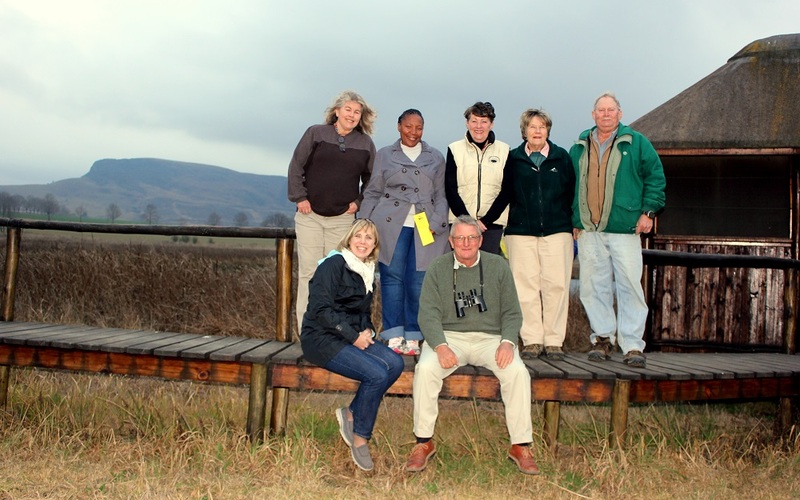 During the walk at the Mount Gilboa Nature Reserve in April, which was organised by the Karkloof Conservancy and lead by Kevin McCann of the Wildlands Conservation Trust, as well as Donna Lay who is the manager of this reserve. 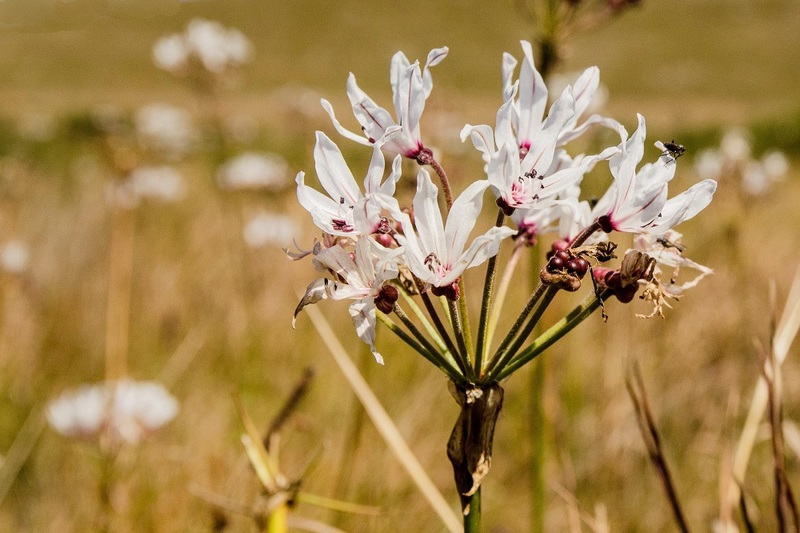 What stood out most in this grassland and wetland habitat, was a gorgeous display of these special White Nerine, Nerine pancratioides. 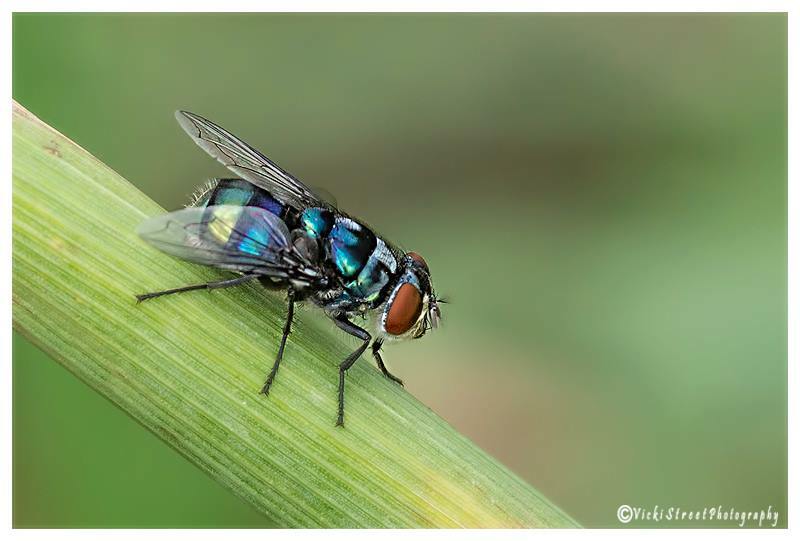 One picture is enlarged to show a fly with a long proboscis coming in to feed and pollinate. 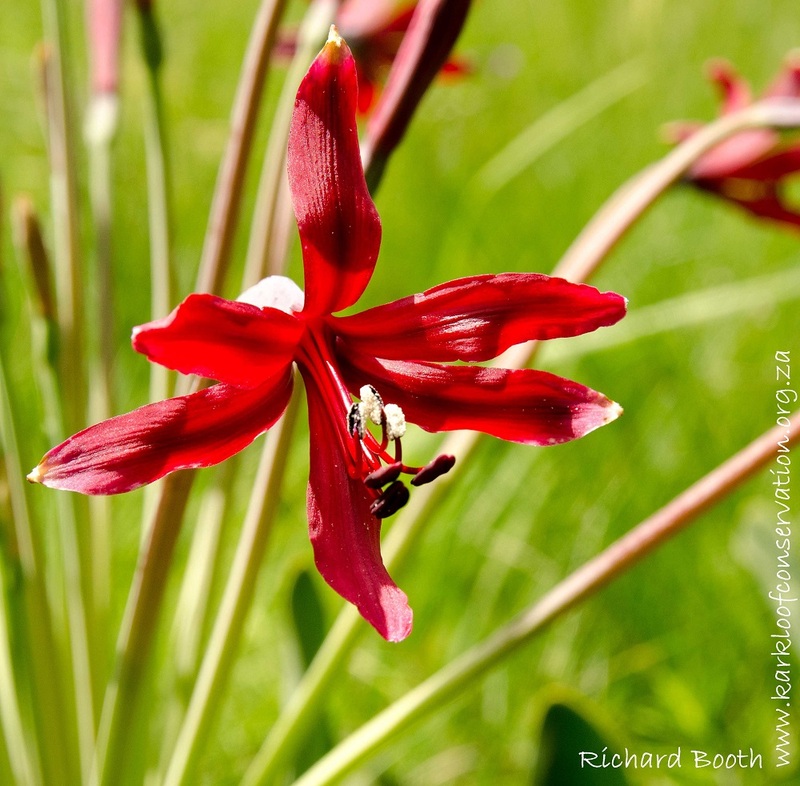 Spoiler alert: This is the flower chosen for April in the Midlands Conservancies Forum calendar which will be on sale from September! 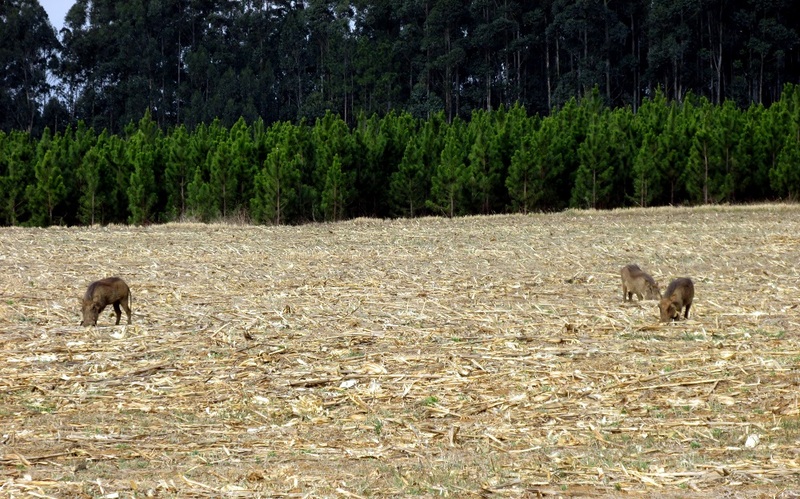 On the 16 April, AJ was fortunate enough to see a Serval catching mice or rats in the maize lands near the Polo grounds in the early hours – 00h30! He watched it jump around as it tried to pounce on the little rodents. 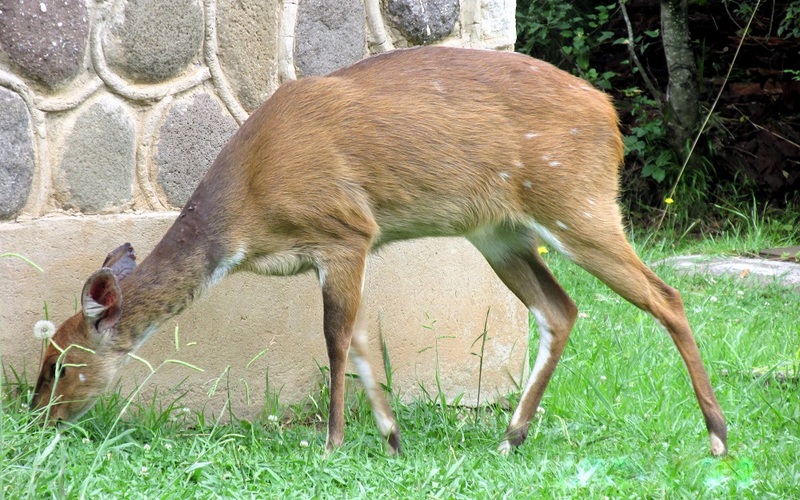 He has also been seeing a variety of buck around Loskop, which includes Common (Grey) Duiker, Common Reedbuck and a female Bushbuck that came into the garden. 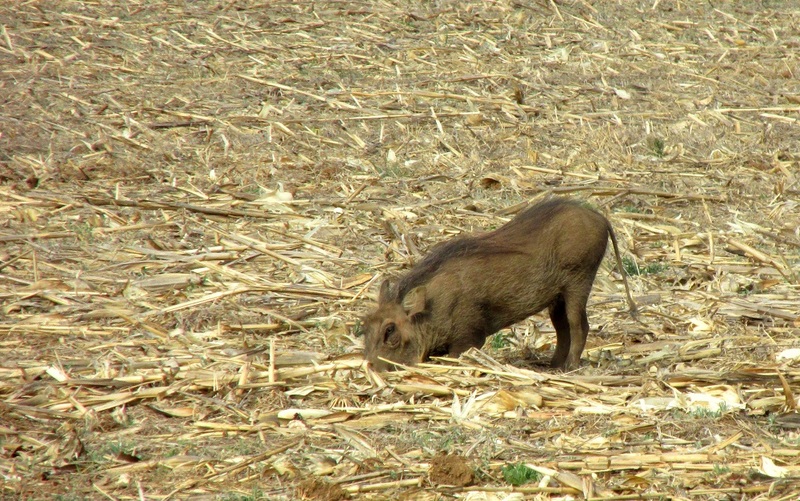 Something he has been noticing more often are about 4 Warthogs in the cut maize lands near the club. 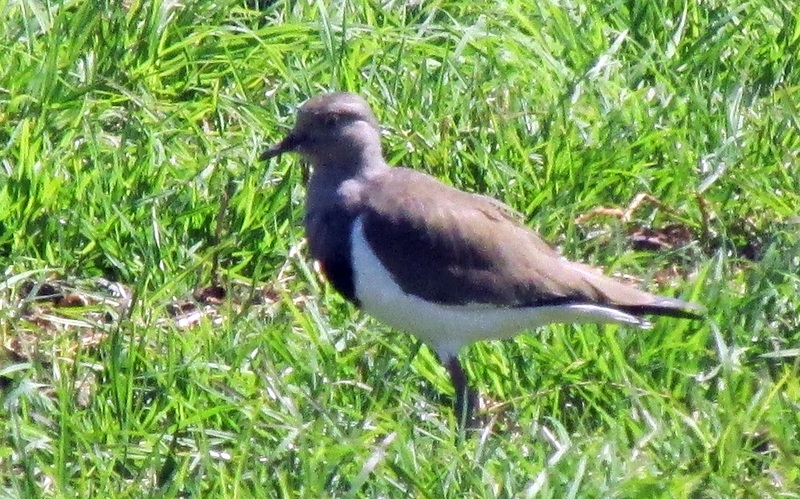 Another interesting offering were photographs of the Black-winged Lapwings which he noticed around the farmlands, especially under the irrigation systems. 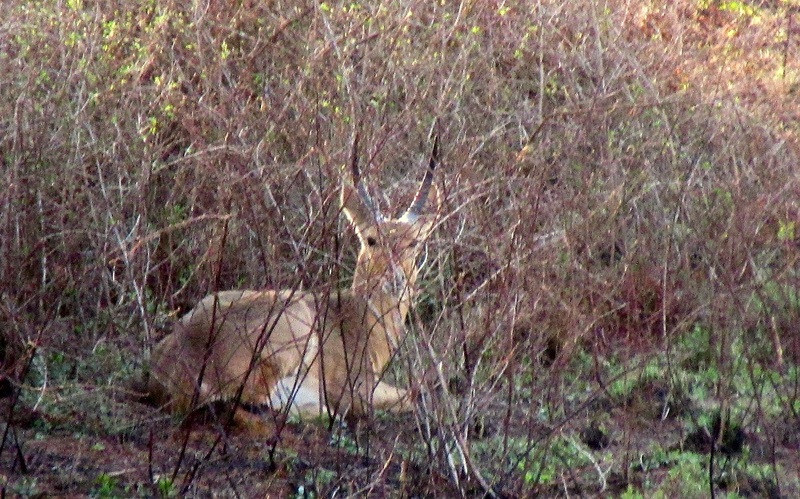 There are easily over a hundred of them that gather in an area. 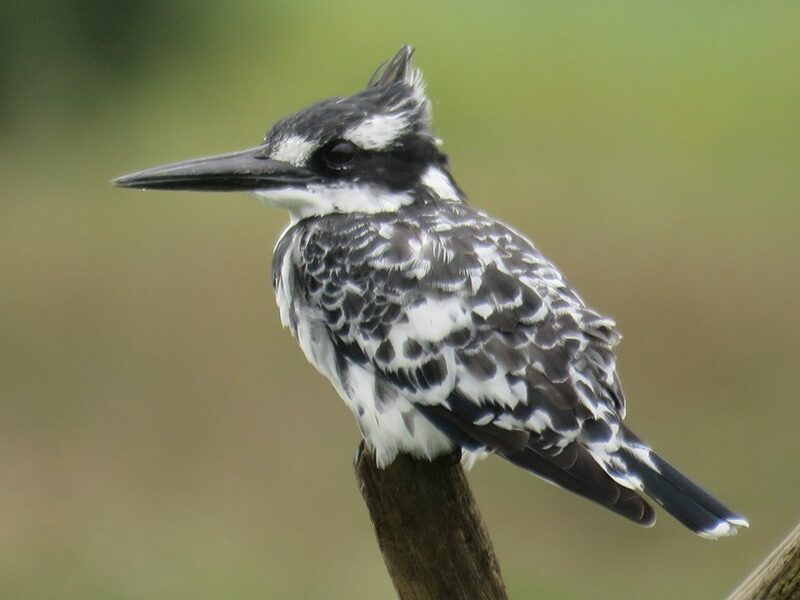 Shortly after his sighting, Graham and Trish McGill, from Umtentweni KZN, popped into the Conservation Centre and was desperately looking to photograph some of these birds for his website. 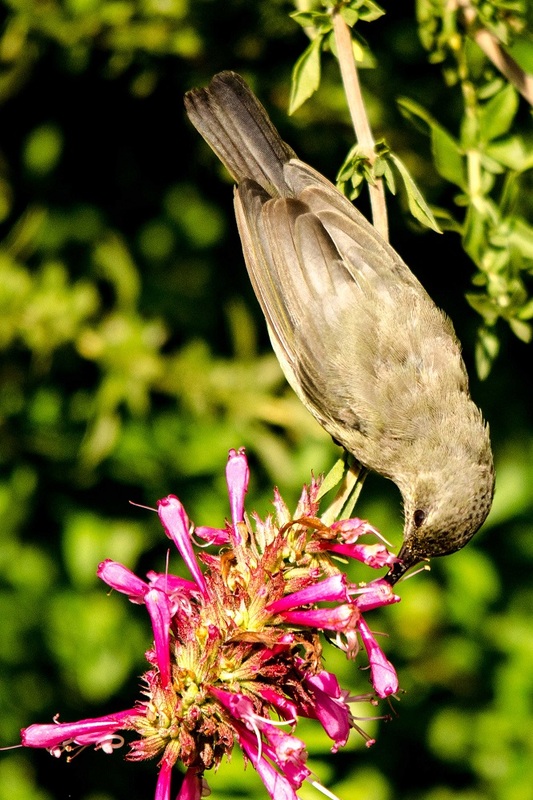 This is a great website to use when confirming the identification of a bird species. 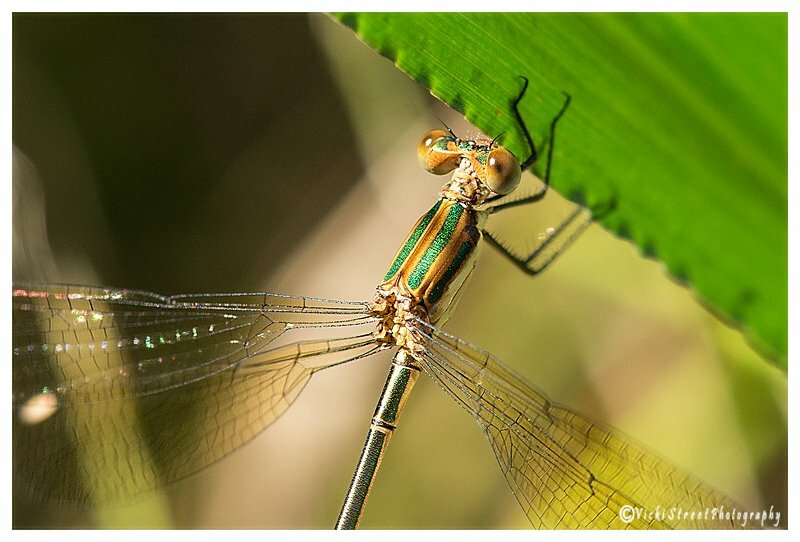 Vikki, a regular visitor to our Conservation Centre, took these magnificent photographs in April of Damselflies, Ladybugs, Spiders, Flies and Butterflies. 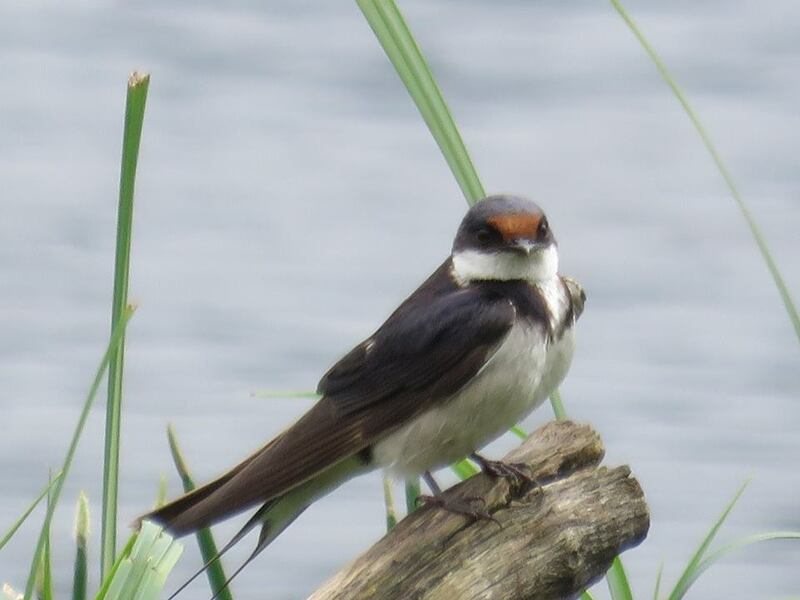 These creatures are often the food source for many of the birds that you see from our hides. 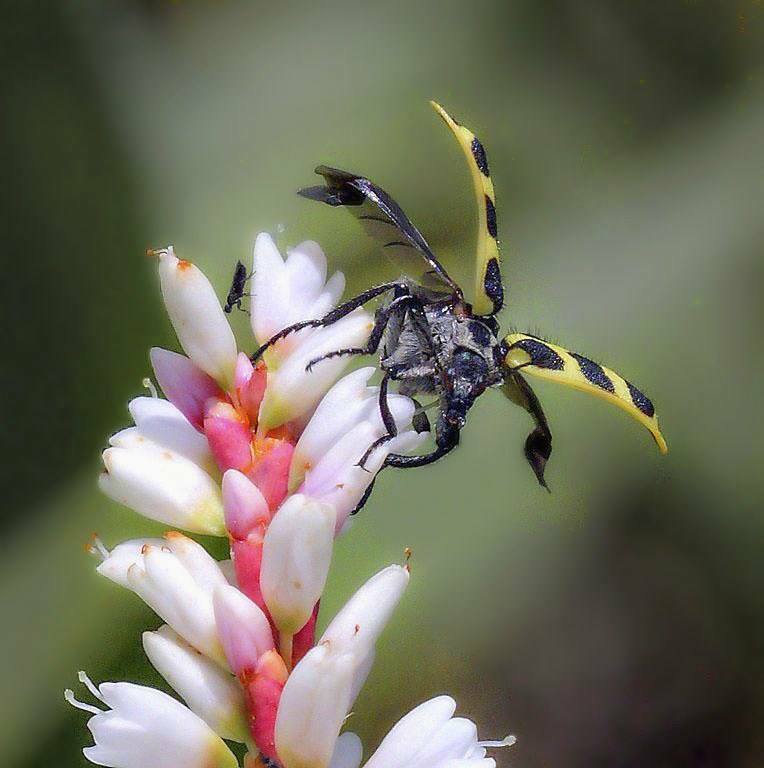 At a recent talk at the KZN Midlands Bird Club meeting, David Johnson spoke about “50 ways to eat an insect”, which was not only humorous, but a wonderful insight into the many adaptations of insectivorous birds. 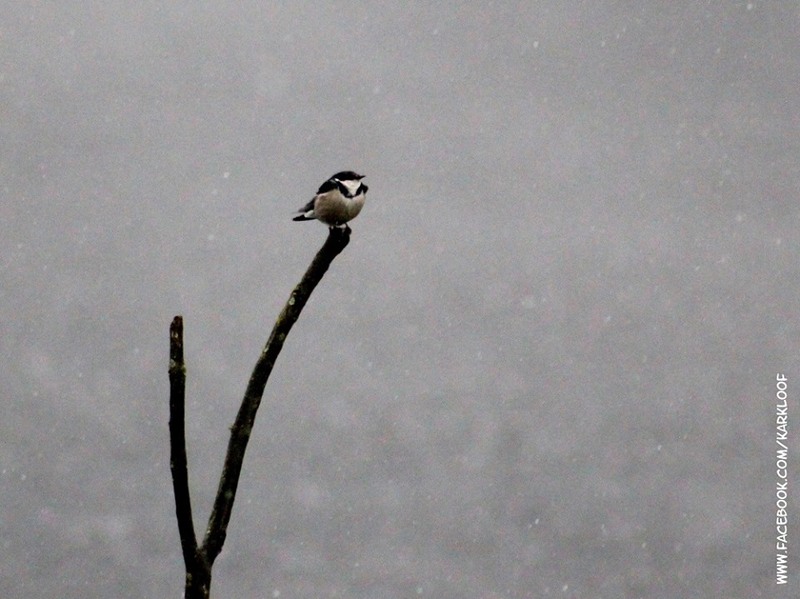 Next time you’re birding, keep your eyes open for the little wonders. Spent a very pleasant morning at Karkloof and was lucky enough to capture a Wattled Crane. It really is a superb place to visit. 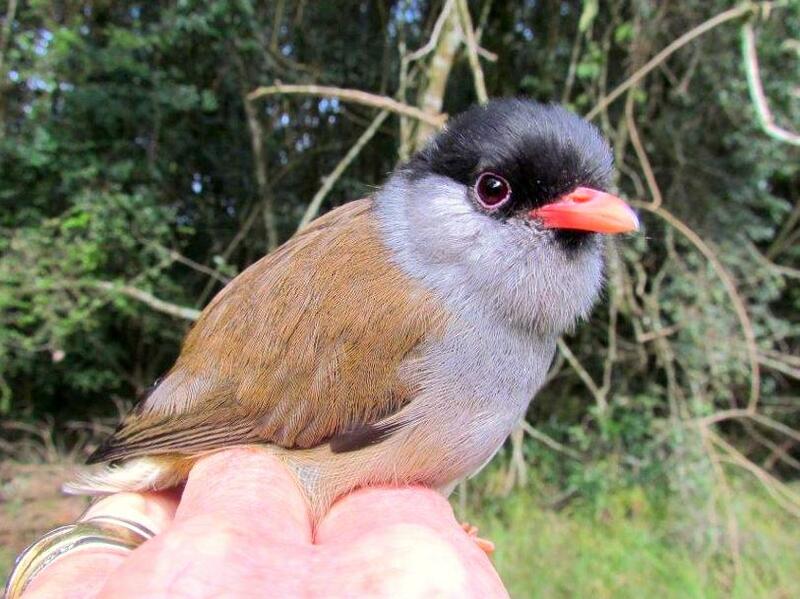 This entry was posted in KZN Midlands Wildlife and tagged bird ringing, cape parrots, grey crowned cranes, insects, karkloof, Karkloof Conservation Centre, orange ground-thrush, warthog, wattled crane on August 31, 2015 by Midlands Conservancies Forum. 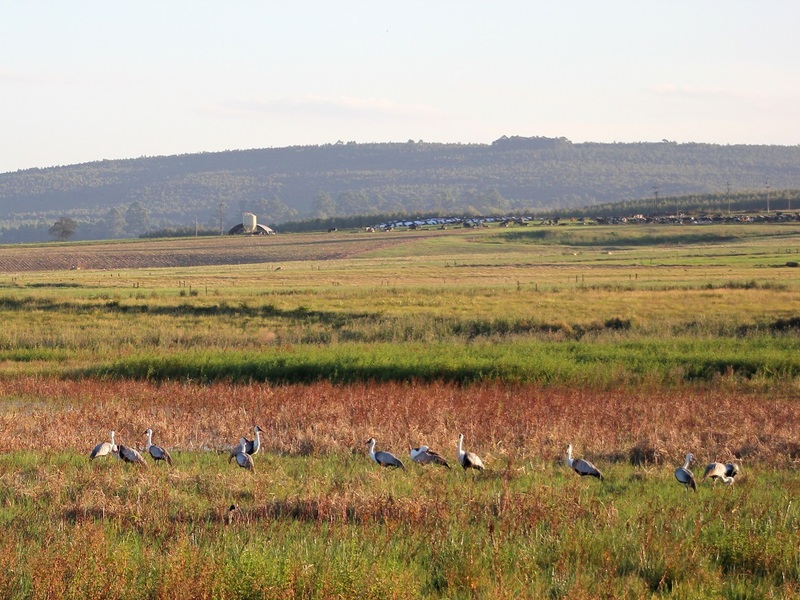 Besides being a short month, February was also a busy one in the Karkloof – the maize which stood “as high as an elephant’s eye” was harvested, so Gartmore hide is now surrounded by bare fields (filled with lots of Spur-winged Geese, Egyptian Geese, Blacksmith Lapwings, Speckled Pigeons, Red-eyed Doves, Cape Turtle-Doves, Grey Crowned Cranes and Wattled Cranes), Karin Nelson had a bird ringing morning, and the Three Cranes Challenge saw a host of volunteers assembling to cater for the ‘maniacal‘ marathon runners. 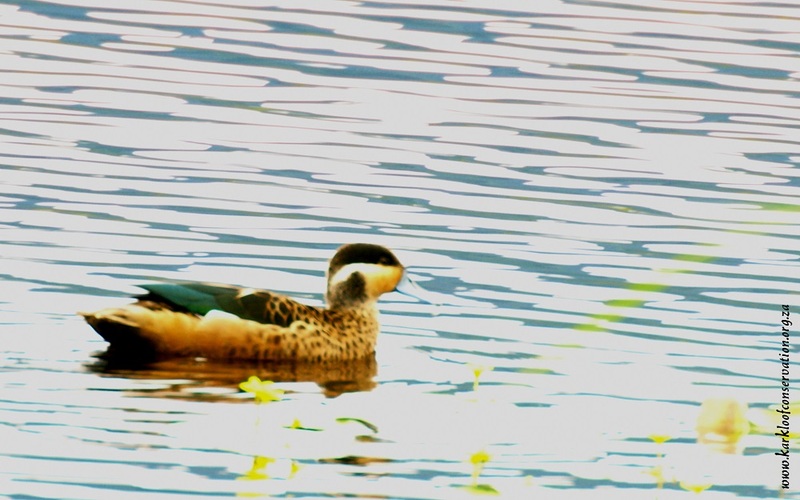 We had a new visitor to the Gartmore pan who is now included on our bird list – a Hottentot Teal. 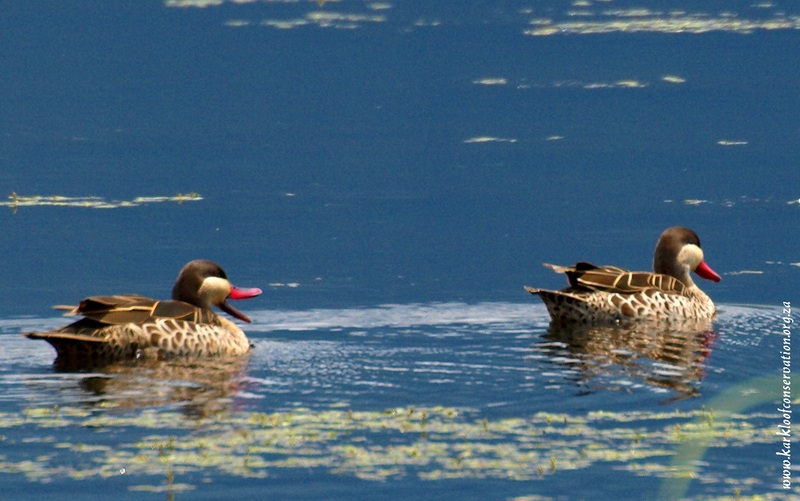 It was much easier photographing their relatives, the Red-billed Teals, as their bills don’t get camouflaged against the reflection of the blue sky in the water! The local rodent, frog and reptile populations must have experience a rapid decrease in February with all the raptors that were out and perched on the centre-pivots. 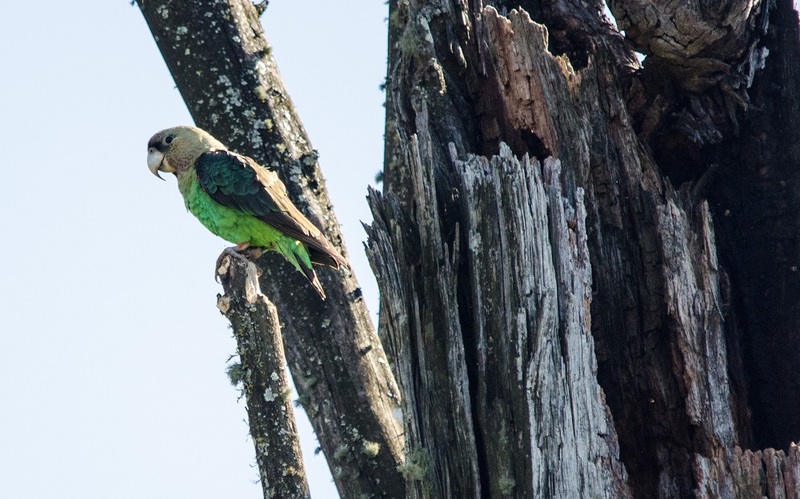 These included the Amur Falcon, Jackal Buzzard, Yellow-billed Kites, Steppe Buzzard, Long-crested Eagle, Black-shouldered Kite, African Marsh-Harrier and the African Fish-Eagles. Please remember to avoid using poisons to control your rat populations and seek “raptor-friendly” options! White-breasted Cormorant, Reed Cormorant, Bronze Mannikin, Cape Wagtail, African Jacana, Common House-Martin, Common Waxbill, Red-billed Quelea, Black Crake, Blue Crane, Yellow-fronted Canary, Cape Shoveler, Little Grebe, Lesser Striped Swallow, Southern Grey-headed Sparrow, Levaillant’s Cisticola, White-faced Duck, Amethyst Sunbird, African Paradise-Flycatcher, Black-winged Lapwing, Little Rush-Warbler and Burchell’s Coucal. 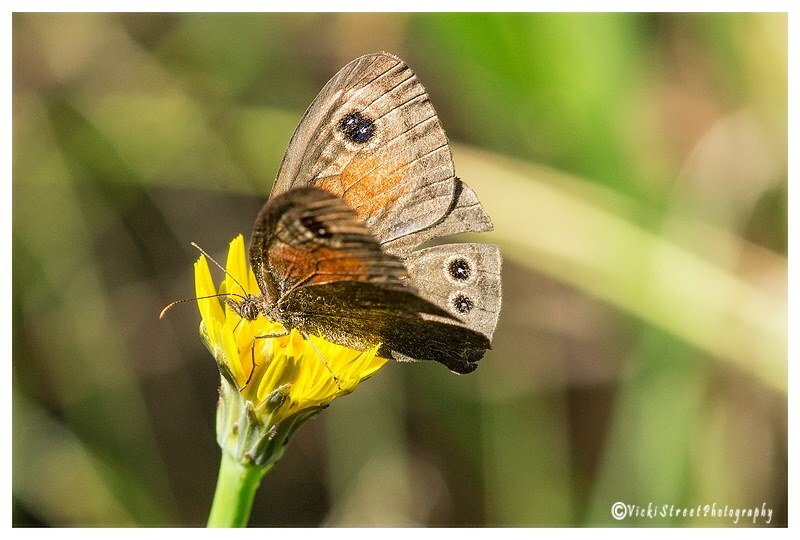 Hugh Watson, a regular visitor to the Karkloof Conservation Centre bird hides took these breathtaking photographs during his recent visit. 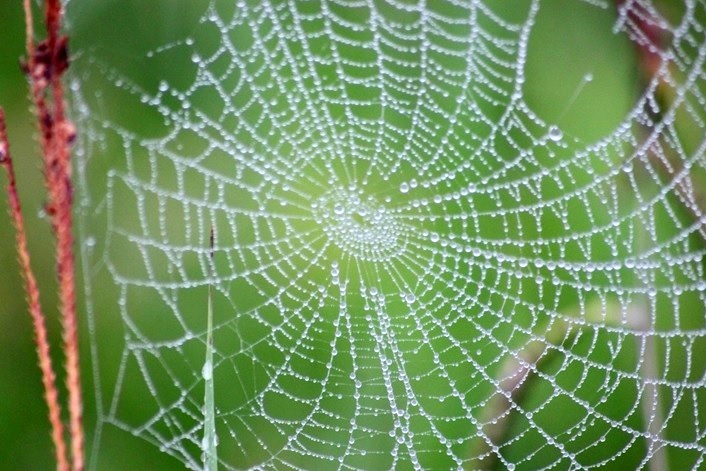 Can you spot Wally, the yellow spider? 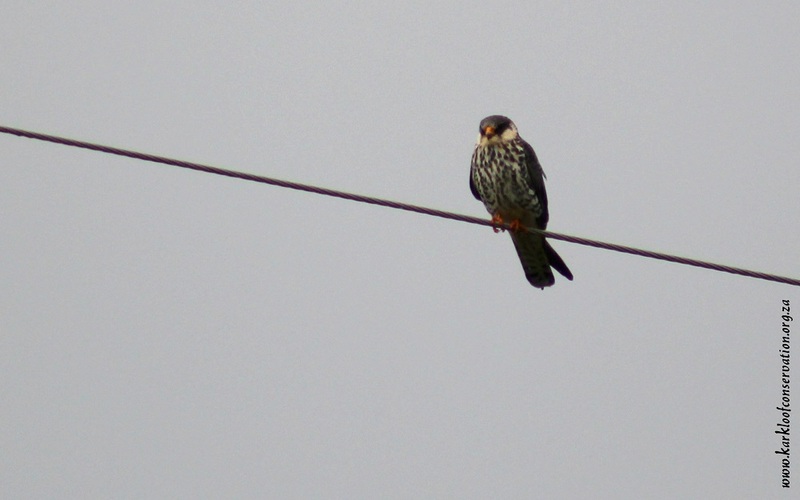 My sighting is very vague – it looked like an Eurasian Hobby – from the falcon like head and very curved back wings and thin tail (just like a big swallow) repeatedly dive bombing what appeared to be a Steppe Buzzard – too far to actually be definite. On Saturday morning the 28 February, I was faced with the choice of lying in bed and watching the Kiwi’s thrash the Auzzies in the WC or head out to the rainy & wet Midlands to the Karkloof Conservation Centre. 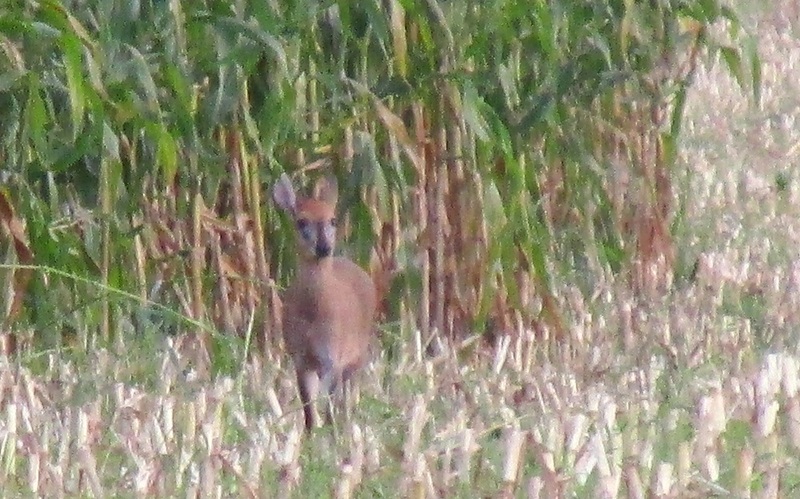 I was rewarded with a some awesome sightings, so I believe I made the right call. At first I thought the birds were probably all snuggled up in bed watching the cricket. 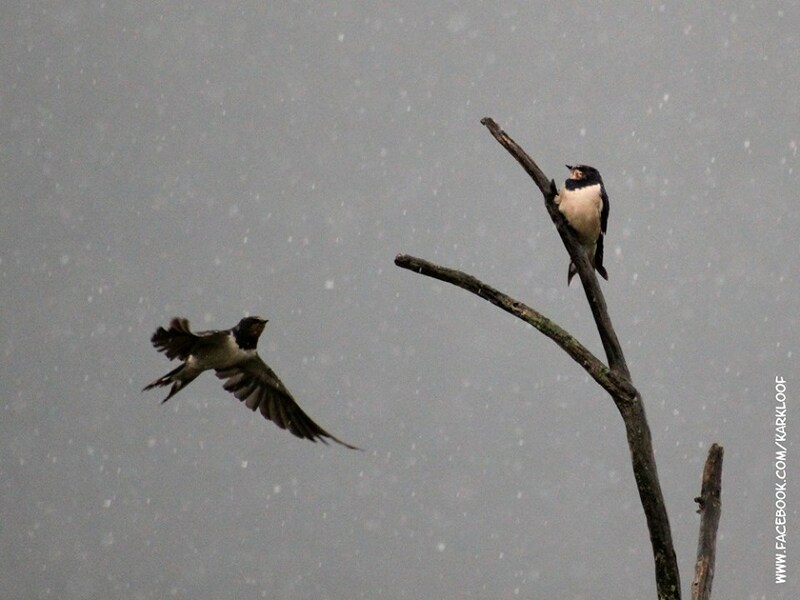 These photographs are of a White-throated Swallow, Pied Kingfisher, Yellow-billed Ducks and a pair of intimate Brown-throated Martins. 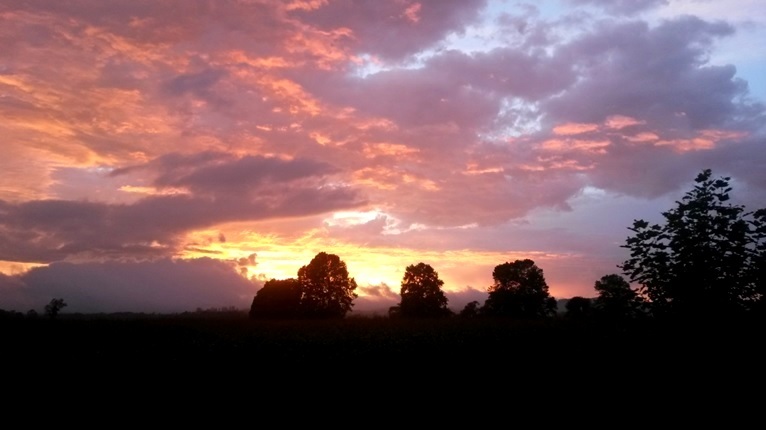 Friday was a day in Fairyland, after a beautiful sunrise and being situated in the forest at Karkloof Canopy Tours. 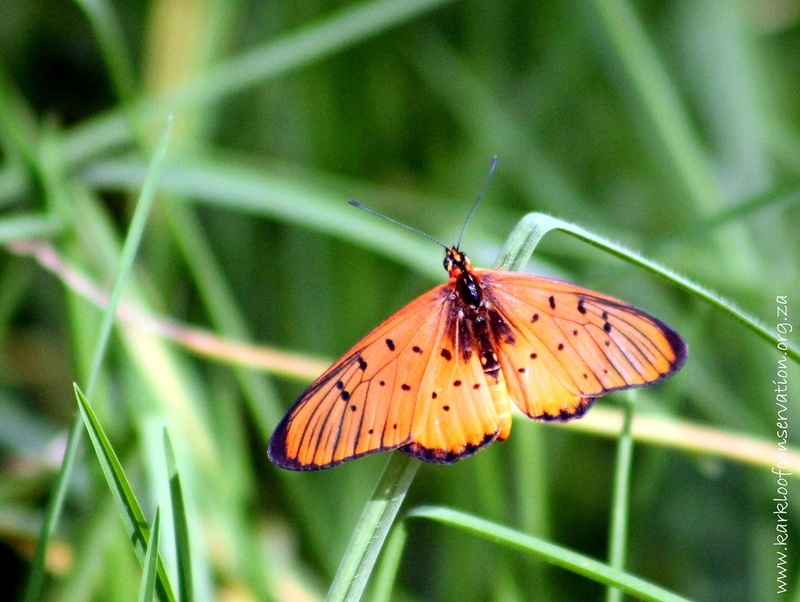 The sunlight reflecting off the wings of the butterflies and dragonflies could have been glimpses of fairies. The Samango monkeys and Loeries (now known as a Turaco) watched the show as the competitors enjoyed the canopy tour. The floor moved as the bright yellow crabs and finches carried on with their activities. The troll that I heard turned out not to be a troll, but Kai from the canopy tours coming to check how everything was going. and looking for some of the little things. 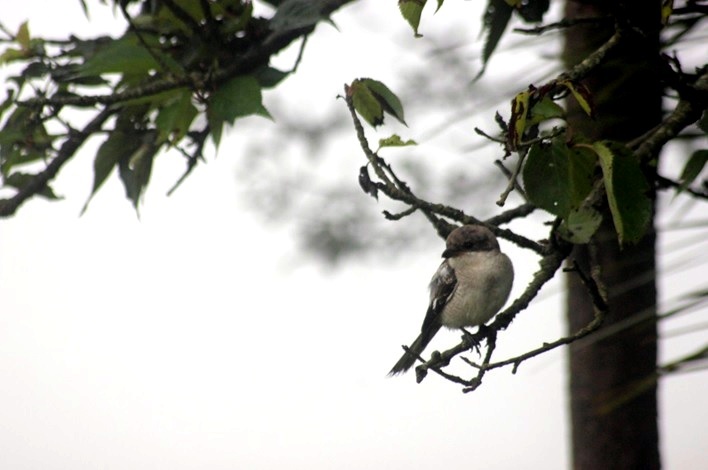 A juvenile fiscal shrike kept us company for a while. Sunday did not show us the same spectacular sunrise as last year, but the surface of the dam displayed an incredible reflection. 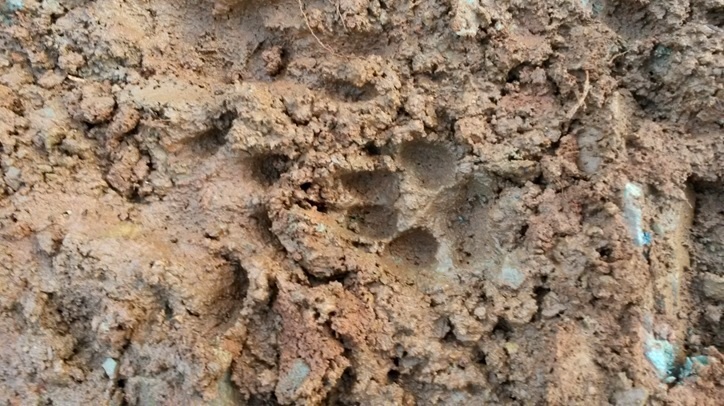 The signs were there that the caracal had departed not long before we arrived. 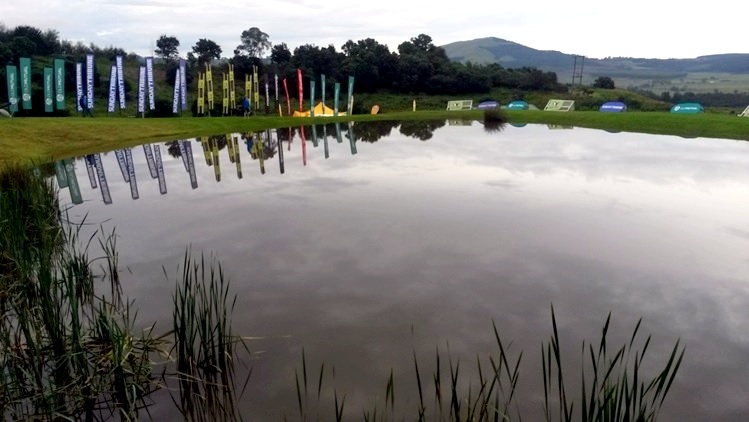 The dam at Bushwillow Park was a welcome sight at the end of the 3 days. 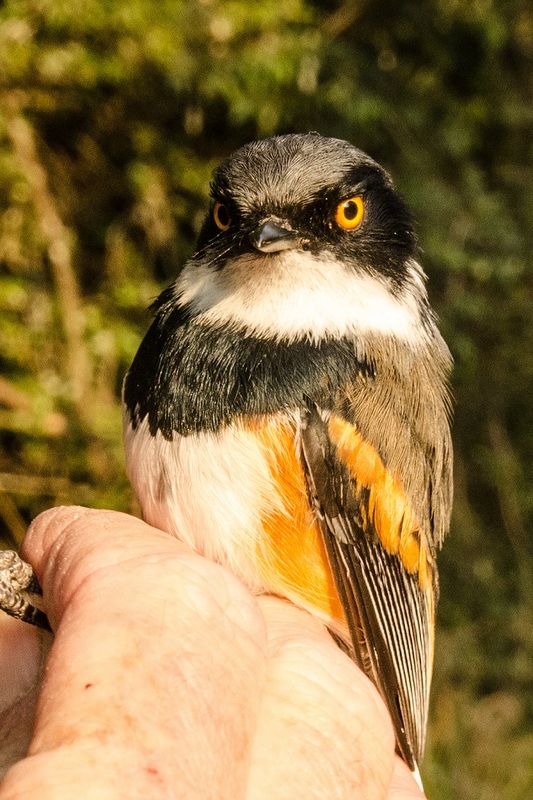 On the 11 February, Karin Nelson hosted a bird ringing day at our Conservation Centre. The day was well attended and we were pleased to see all the homeschoolers that made use of the activity as part of their studies. Village Weaver waiting to be collected. 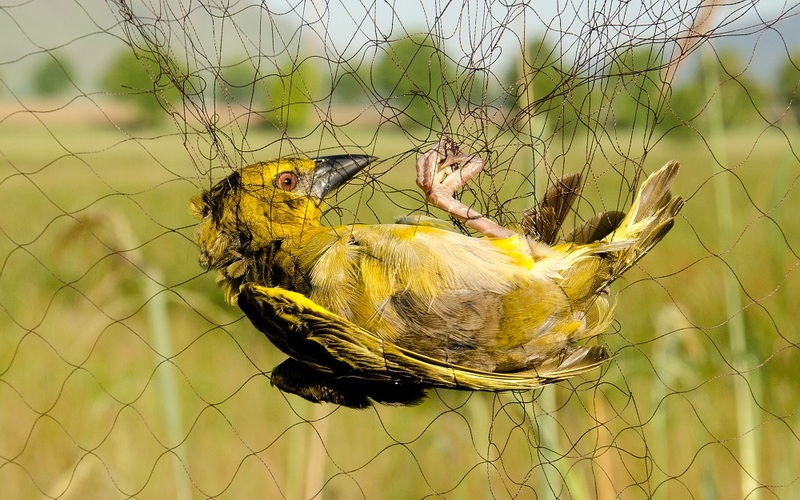 The netting gently captures the bird. Qualified bird-ringers know all the tricks so that they may safely remove the bird without any injury. Photograph by Richard Booth. There were also some visitors who were curious about how ringing impacts the birds, but were very pleased to see how gentle and competent Karin is and that the birds were so calm during the process. Karin caught a total of 75 birds with 5 of these being re-traps. 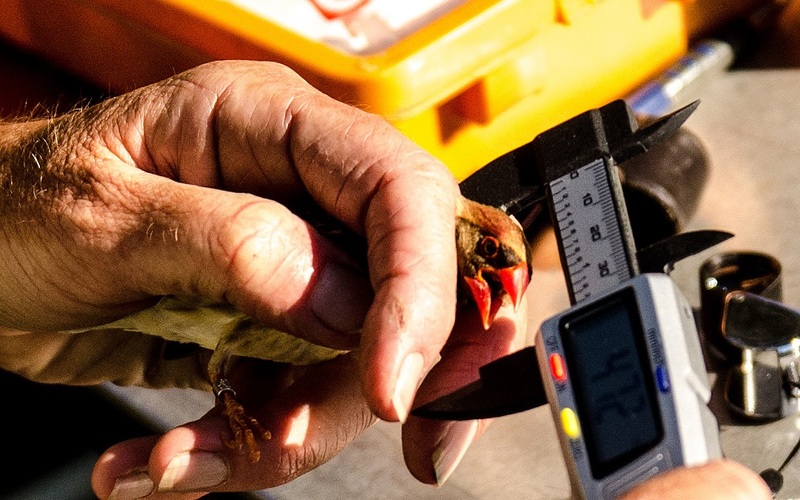 Red-billed Quelea being measured by qualified bird-ringer, Karin Nelson. 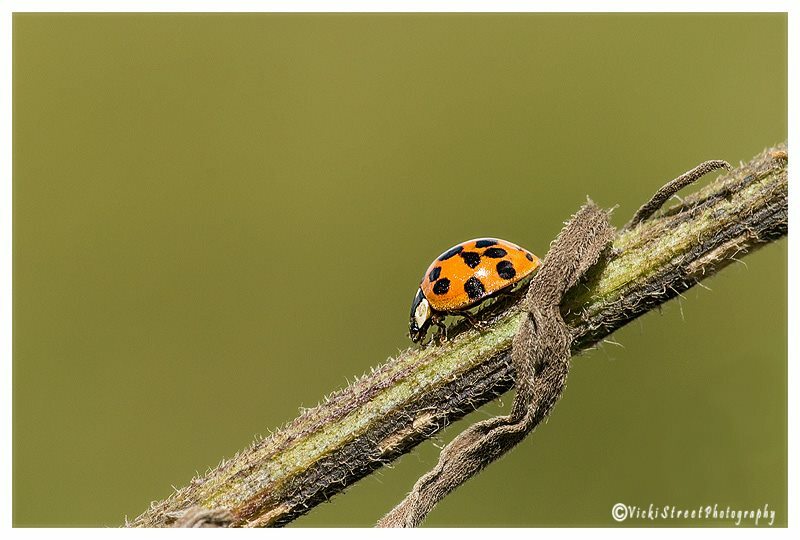 Photograph by Richard Booth. These included: 47 x Red-billed Quelea; 7 x African Reed-Warbler; 6 x Village Weavers; 4 x Southern Red Bishop; 2 x Drakensberg Prinia; 2 x Yellow-fronted Canaries; 2 x Levaillant’s Cisticola; 2 x Fan-tailed Widowbirds; 1 x Pin-tailed Whydah; 1 x Dark-capped Bulbul; and 1 x African Stonechat. One afternoon when I noticed a build up of dark clouds, I decided to hightail it to the Gartmore hide and see what’s out and about during the rain. 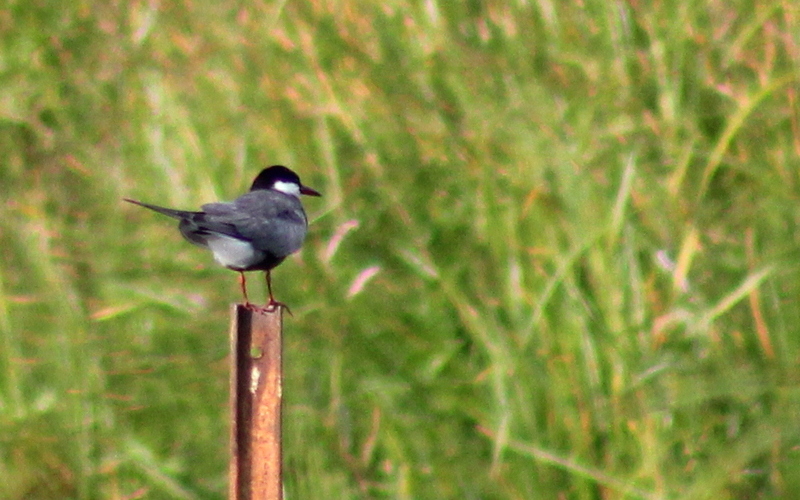 and the last bird I saw was a lonely little White-throated Swallow. 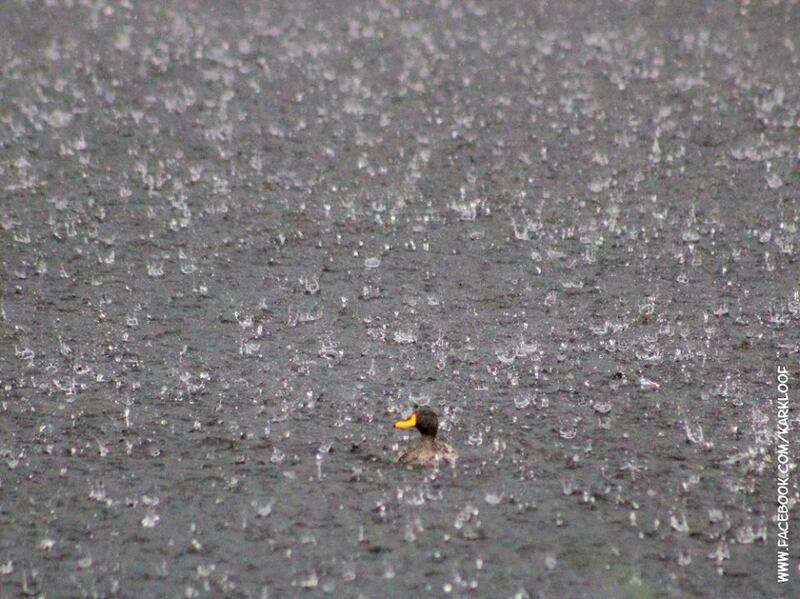 These birds all weathered the storm and remained there the entire time. I arrived back at the office a drowned rat, but a happy one indeed! 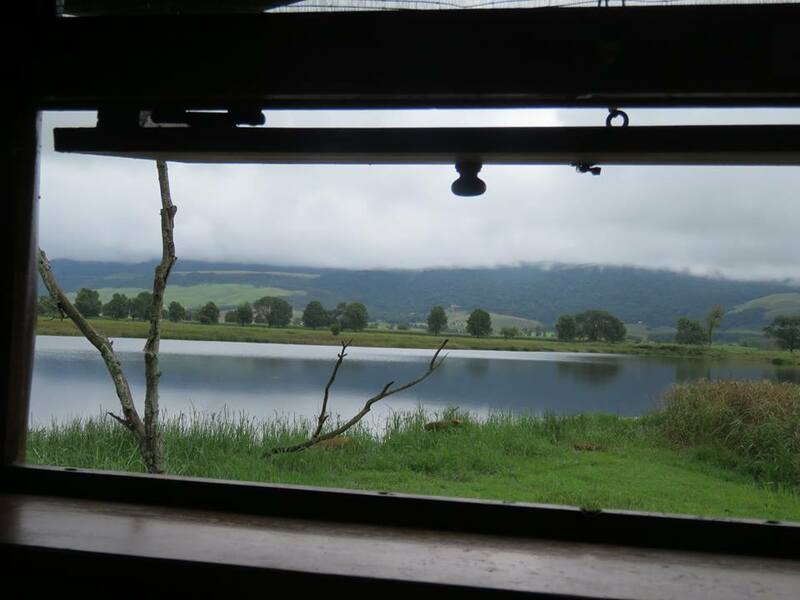 This entry was posted in KZN Midlands Wildlife and tagged african jacana, bird ringing, brown-throated martin, butterflies and other insects, karkloof, Karkloof Conservation Centre, mistbelt forest, pluviophile, raptors on April 8, 2015 by Midlands Conservancies Forum. I apologise for the delay in issuing this edition, I had a short break down the South Coast. We have a real pot pourri (or should I say an Irish Stew!) this month, with flowers, birds and a toad. 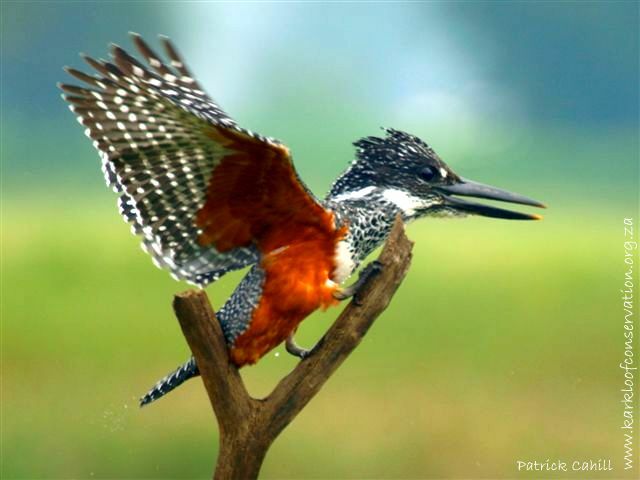 For several years after the Karkloof Conservation Centre opened I had the mutters because I had only once seen a Giant Kingfisher and when I did it was so camera shy I couldn’t get a good picture. Last month a much braver bird put in an appearance and gave me the chance to take too many shots – that’s the problem with digital photography! Twané had some great sightings in January. 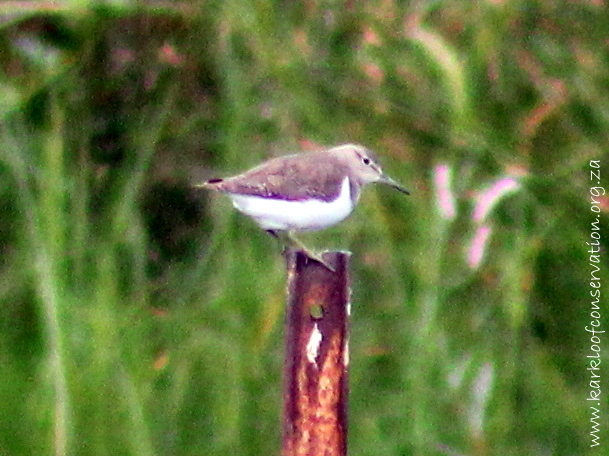 She managed to get a photograph of a Common Sandpiper that was a regular visitor to the distant muddy shore of the Gartmore pan. 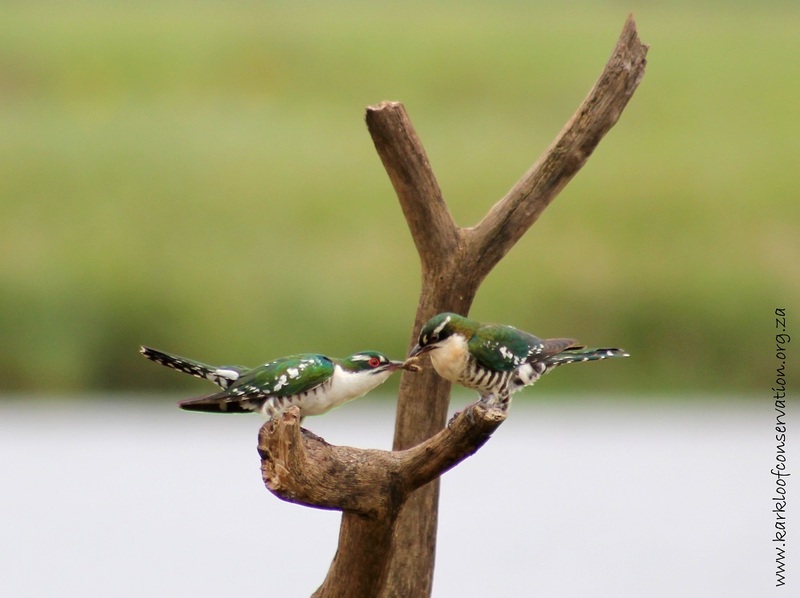 Twané was lucky to get this shot of a male Diderick Cuckoo feeding a female – the way to a woman’s heart is through her stomach. 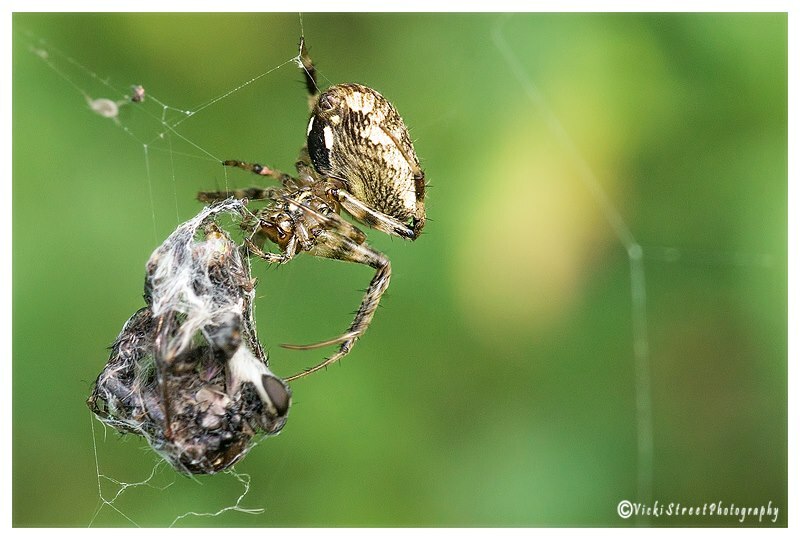 The male fed her 3 juicy caterpillars and offered them to her with a gentle bobbing motion. They flew off into the sunset after the third one. 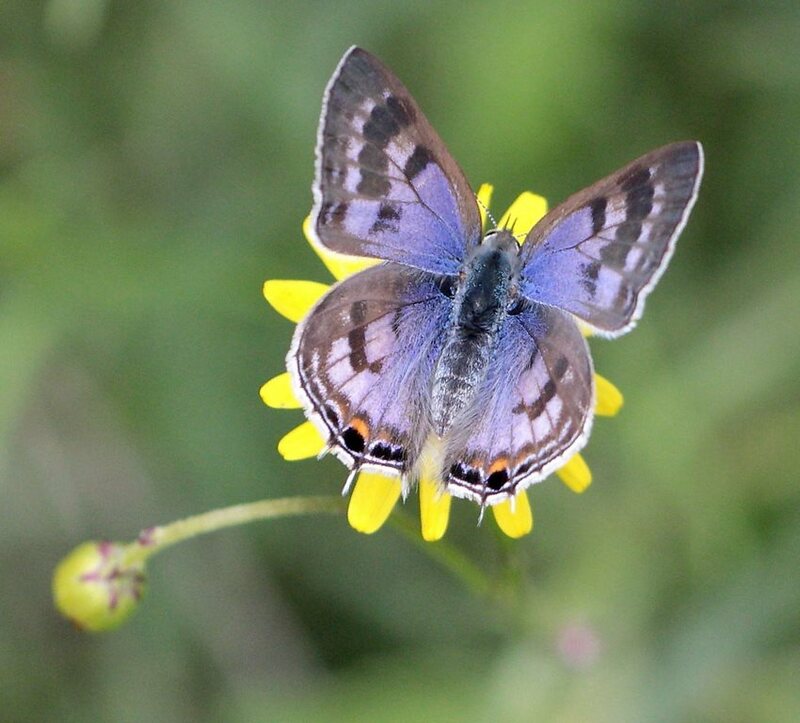 The butterfly that is photographed looks like it could be a male Window Acrea (Acrea oncaea). 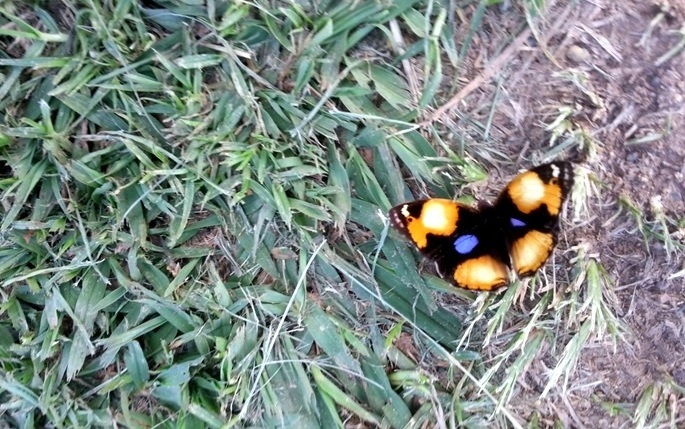 We would appreciate the correct ID from any Lepidopterists that might have a better idea of what it is. On a recent frogging expedition by the EKZNW Kids Club, the kids found plenty of these little Painted Reed Frogs in the wetlands and mealies. We have often had queries from visitors about the effect of the centre pivots used by local farmers for irrigating crops on the wildlife in the area and particularly on the cranes. 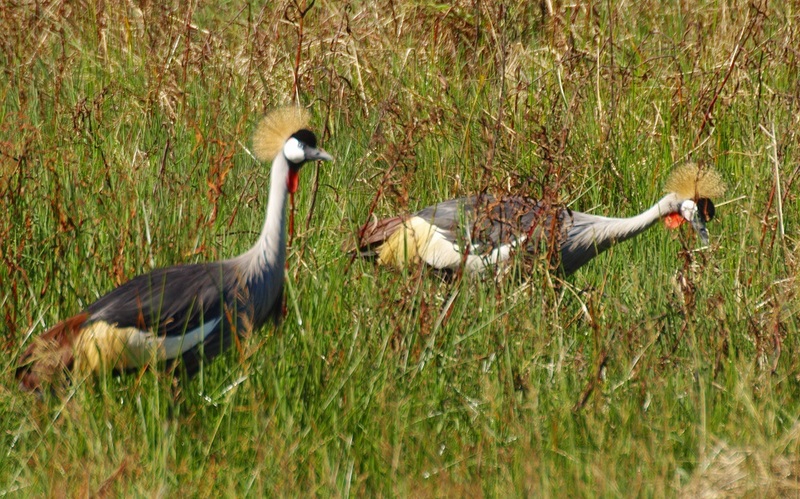 The pictures of the Wattled Cranes and the Grey Crowned Cranes taken this month show that they do not impact the local fauna negatively. They act as excellent perches for raptors while they keep the rodent population under control. 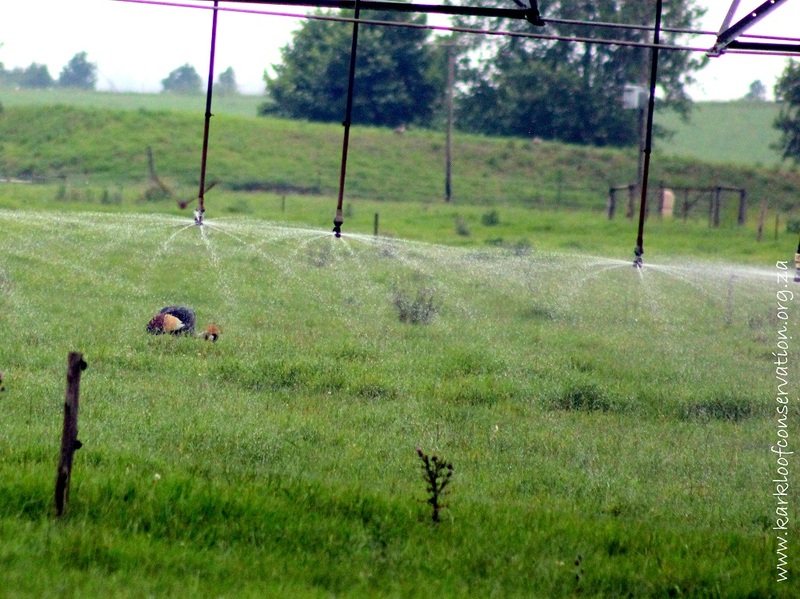 Centre pivots are also an extremely water efficient method of irrigation. We received some exciting news from Britt about a pair of African Grass-Owls that are nesting in their grassland. They have seen a pair hang around before, but have finally confirmed that they have decided to breed on their farm. 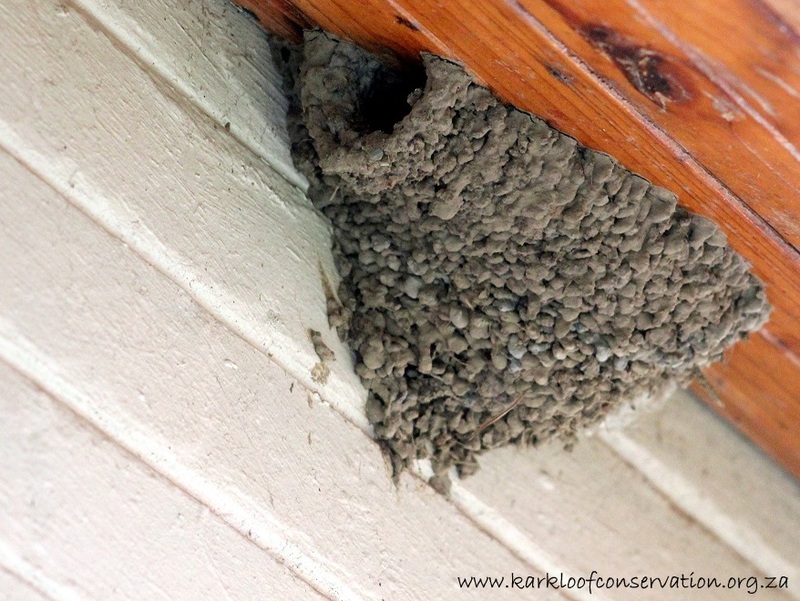 They have reported this sighting to Ezemvelo KZN Wildlife who keep an active record of nest sites of various species. According to the Endangered Wildlife Trust, the African Grass-Owl (Tyto capensis) is a habitat specialist and is mainly restricted to the open, grassy habitats of marshes, wetlands and floodplains. 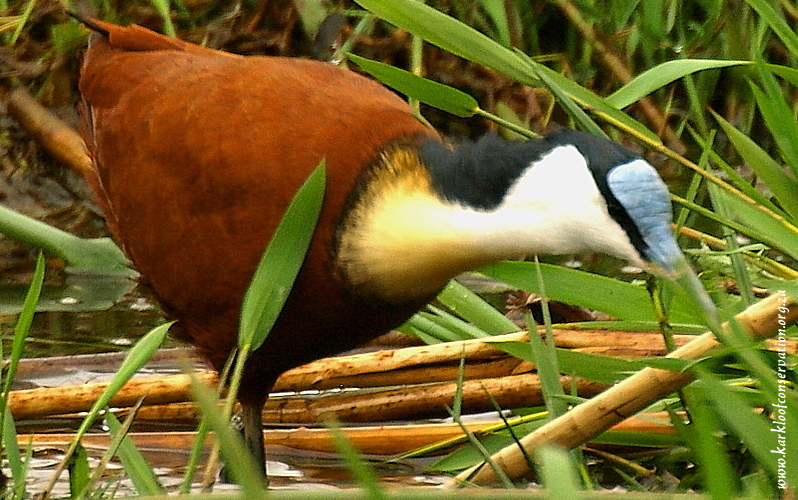 It is estimated that there are less than 5000 of these birds left in southern Africa. 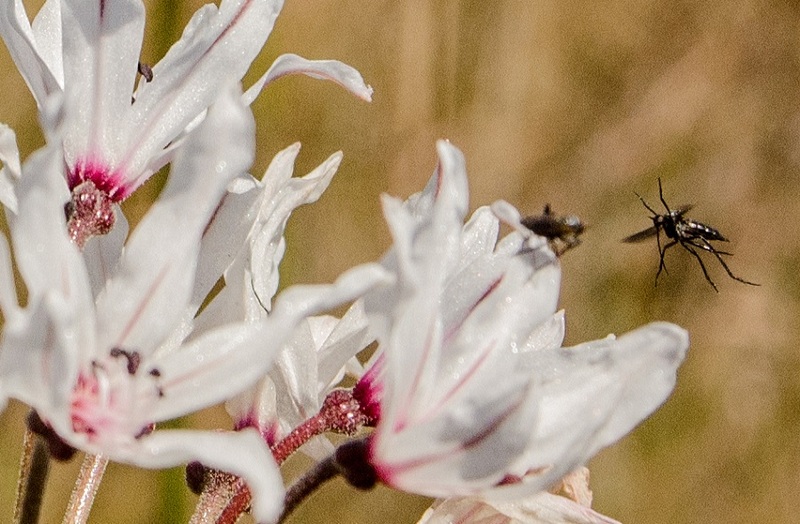 The need for farmer co-operation centred on grazing densities and burning regimes, as well as alien plant control and no longer ploughing up native grassland areas no matter how small is extremely important. Well done Ren and Britt on a fantastic sighting and for taking on the role as custodians of your land. 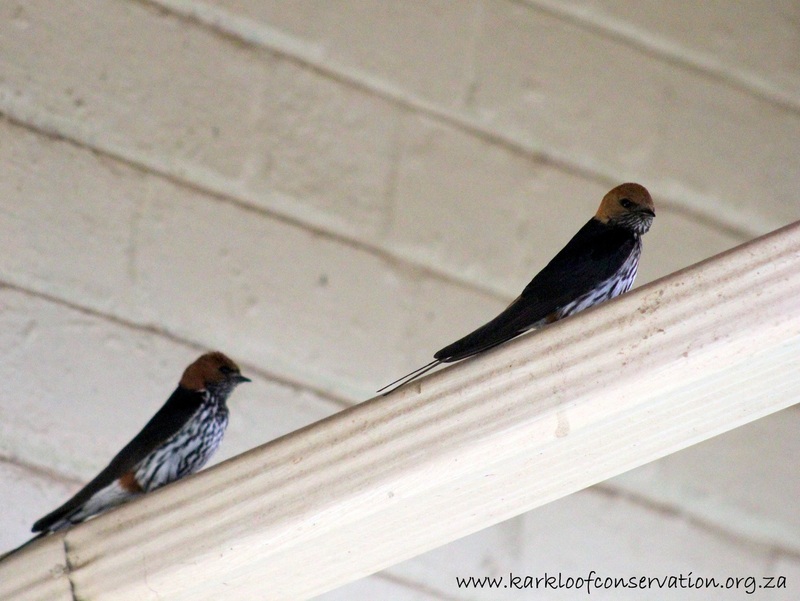 Charlie and Robyn were very excited about this pair of Lesser Striped Swallows that decided to build a nest outside their kitchen window. 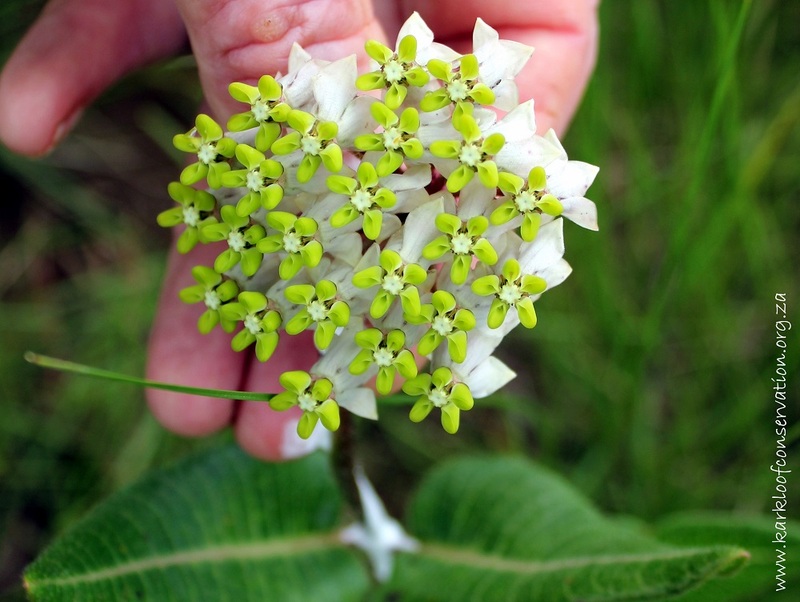 During Robyn’s monthly walk, we found a few of these beautiful Asclepias albens (Cartwheel) flowers which seemed to be a favourite amongst the group. 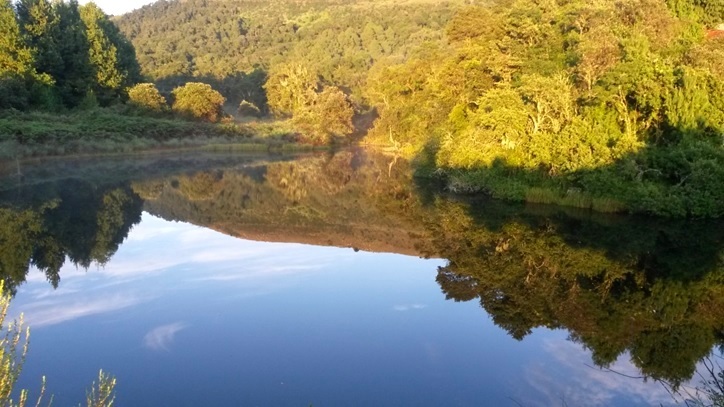 Geoff and Iris Sear from Hillcrest recently drove through the Karkloof Valley and sent us the following interesting sightings. 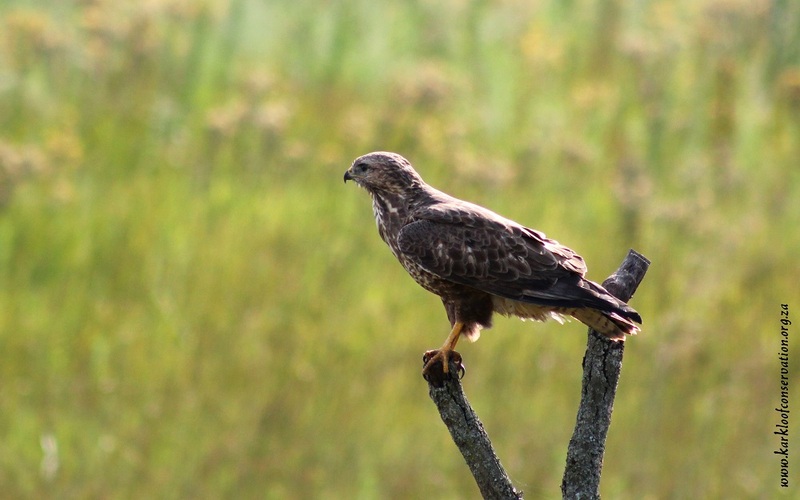 We passed by on our way to Rietvlei a few weeks ago when we were in search of the Forest Buzzard, which we saw just past the New Hanover turn off. We couldn’t get a good photo sadly. 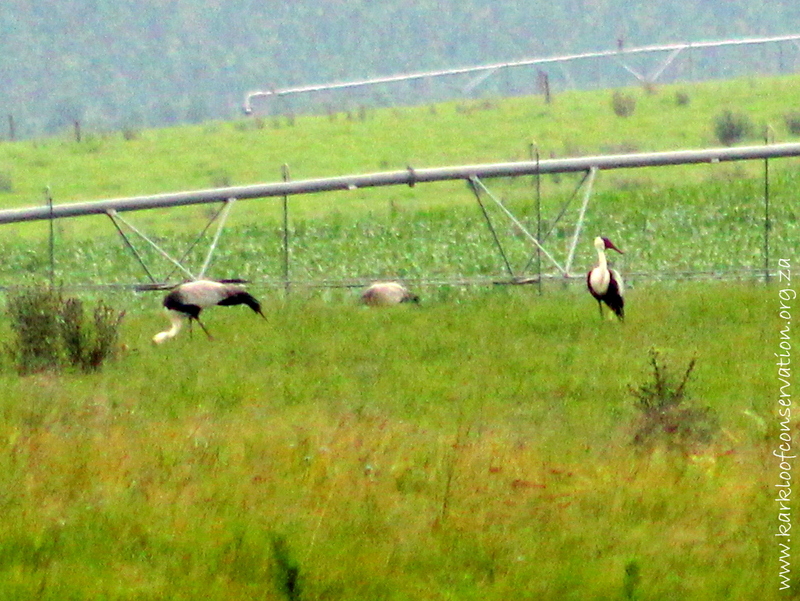 We also saw 9 pairs of Grey Crowned Cranes in the farmlands before we passed by your centre. There were also plenty of White Storks. 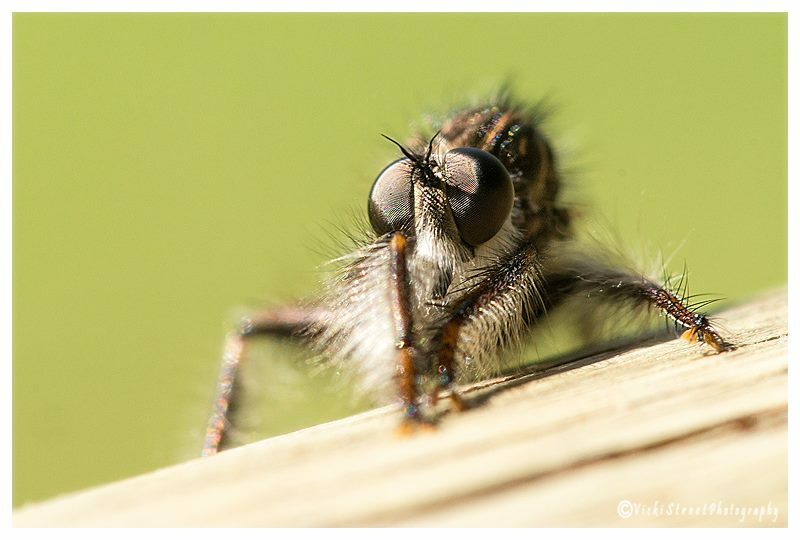 Richard Booth from Mbona is a regular contributor and avid photographer. He sent us a picture of a Red-winged Francolin which had read about Chicken Licken’s phobia about the sky falling on her head and was keeping a weather eye on the stratosphere just in case. 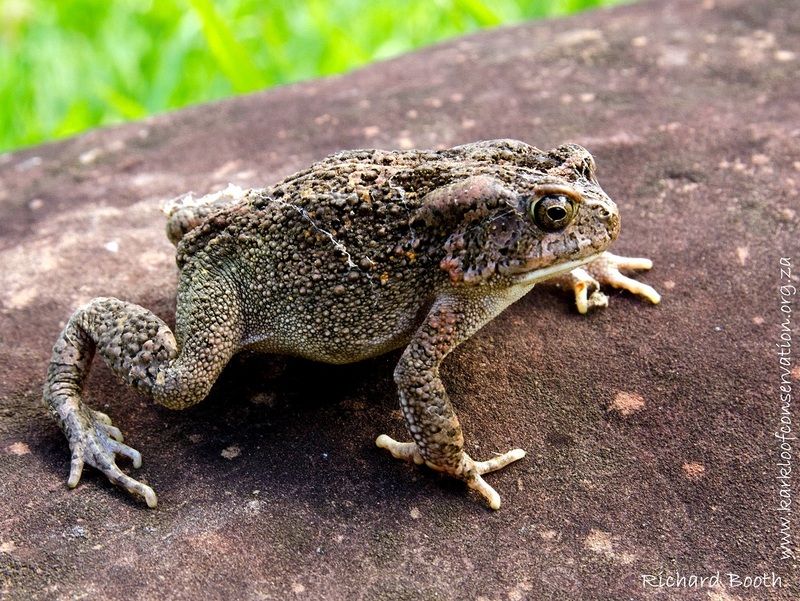 Having gone through medical school, Richard doesn’t believe the ridiculous myth about frogs giving you warts, and he bravely photographed this Guttural Toad! 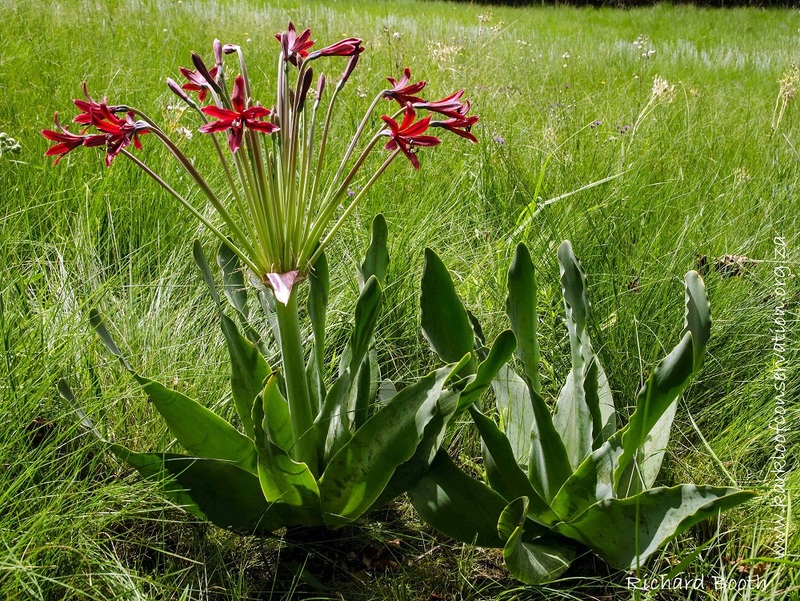 The Brunsvigia undulata, a rare threatened species, was found on Mbona and is a cousin to the more widely spread Brunsvigia radulosa or Candelabra flower. 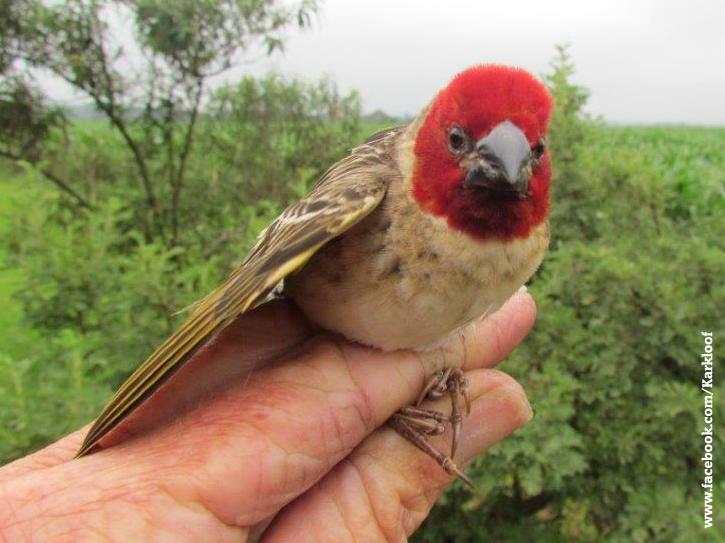 Error correction: In the December 2014 Karkloof Sightings newsletter, we had incorrectly labelled this gorgeous Red-headed Quelea (photographed) as a “Red-headed Weaver”. Many thanks to Pam Nicol for pointing this out for us. We, Karin, Pat and Twané, will all need to go for an eye test! 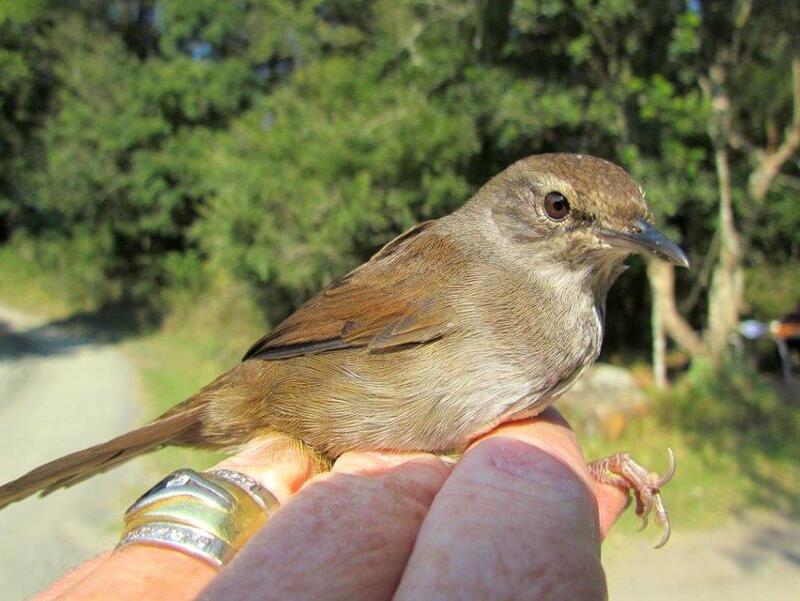 Karin Nelson’s January ringing session produced 33 birds, with 8 re-trapped birds all ringed within the past 2 years, mostly African Reed-Warblers (7). Karin read up on the Reed-Warblers and found that they spend their non-breeding time in drier vegetation, away from water. 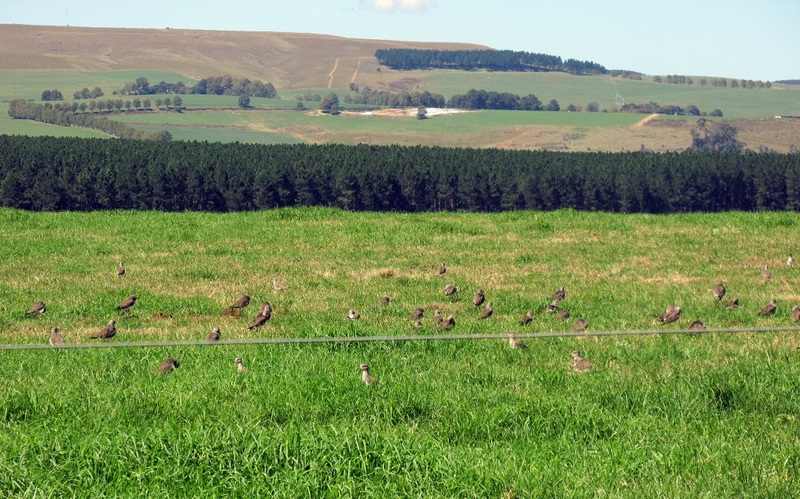 Some birds further north than KZN do move south. At first glance, we had assumed one of the birds to be a Bronze Mannikin, however, it was too big and Karin had noticed a prominent gape. It turned out to be a ‘baby’ Pin-tailed Whydah. It was very interesting to see how similar it looked to the Mannikin. 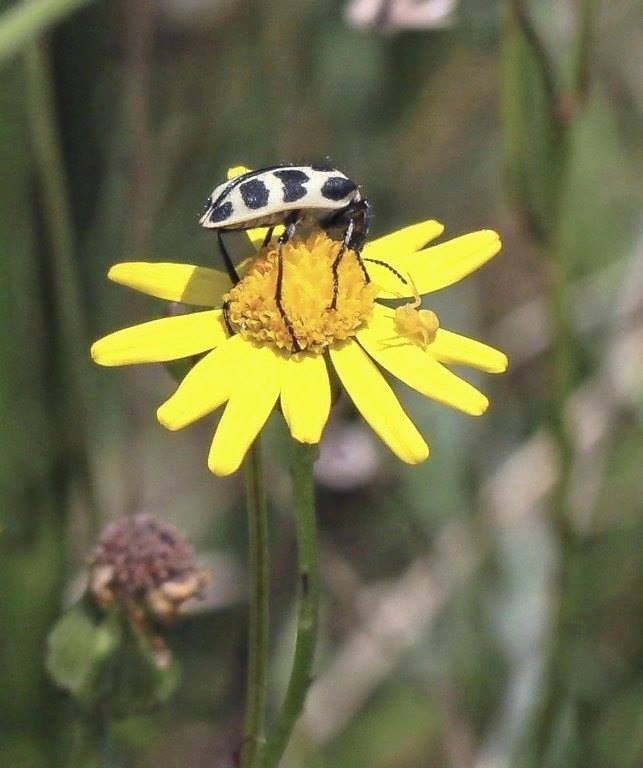 This entry was posted in KZN Midlands Wildflower, KZN Midlands Wildlife and tagged African Grass-Owl, bird ringing, Brunsvigia undulata, butterfly, Centre pivots, cranes, Guttural Toad, karkloof, Karkloof Conservation Centre, Painted Reed Frog, Red-headed Quelea on February 24, 2015 by Midlands Conservancies Forum. 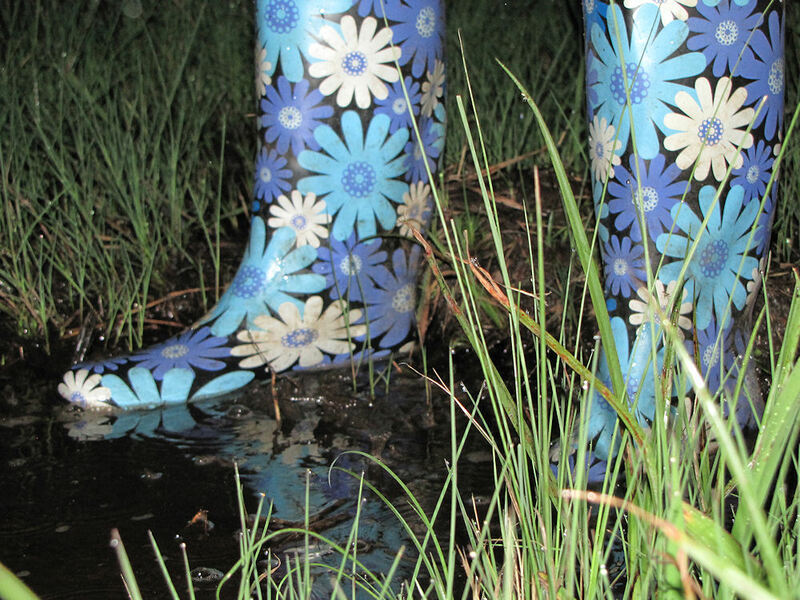 Last night, a barefoot and gumbooted group of frog fans gathered at the Karkloof Conservation Centre for an evening of sploshing about in mud and finding frogs. “African Bullfrogs are my favourites” said John Robbins. “In Grade R a friend brought one to school and I have liked frogs ever since.” One of the first questions asked was what the difference between frogs and toads is. “They are all frogs” said Charlene Russell who was leading the excursion. She explained that the confusion had arisen long ago in Britain where only two frog genera occur naturally – Rana (frogs) and Bufo (toads). Toads are types of frogs. Zoe Goble had been reading a book about frogs and asked about poisonous ones. All frogs secrete a toxic substance from glands on the back of their neck, but in most cases the concentration is small and they are not very poisonous. 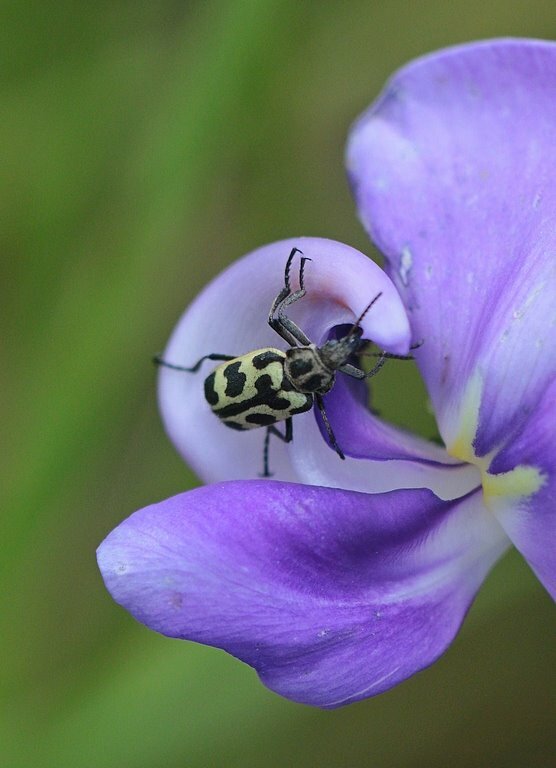 It is the brightly coloured ones found in the rainforests which are dangerous. Everyone was interested to hear about the Platanas (African Clawed Toads) which were used to test pregnancy until the 1960s. 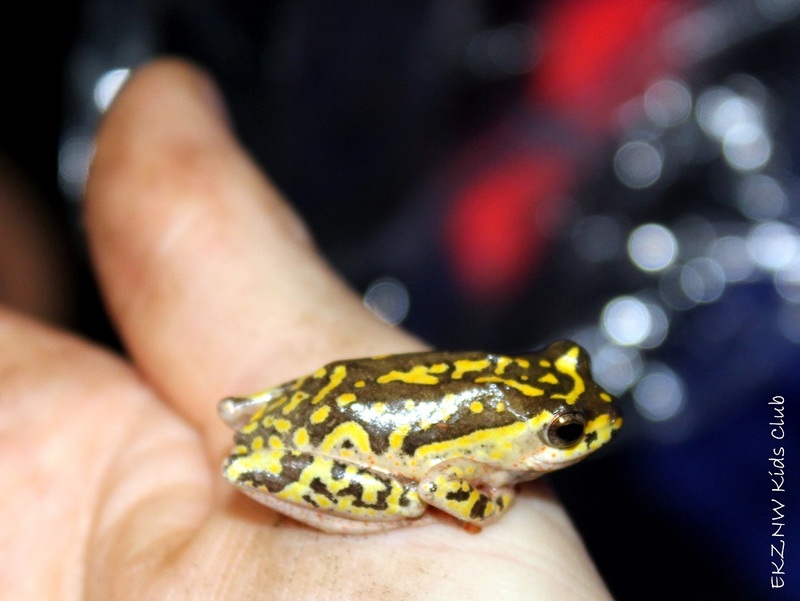 Unfortunately, Platanas have a fungus on their skin which other South African frogs are immune to, but because they have been transported around the world, the fungus has spread to other frogs and is thought to have caused the decline of many populations. We began by listening to recordings of frog calls so we’d be able to identify them more easily once in the wetland. Frogs are more often heard than seen. None of the frogs we heard were calling “Ribbet”, because very few do. Apparently, there is a species of frog which does make that sound in the wetlands around Hollywood, so because we always hear that call in movies, we now say frogs go “Ribbet”! Margaret and Barry Neuborn admitted to listening to frog calls in the car, rather than music! 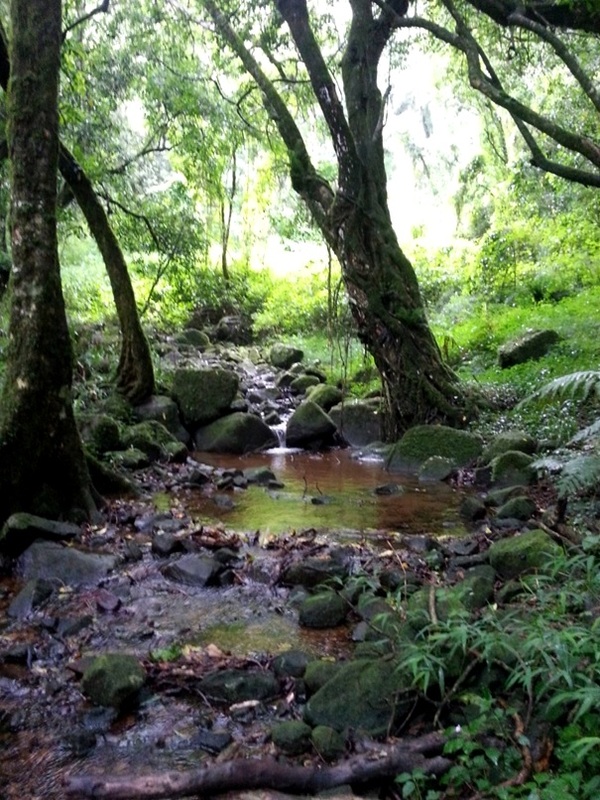 “We hear lots of frogs at might in Mbona because a small stream runs next to our house,” said Margaret. “Often tiny frogs sit on the outside of the window and we can see their hearts beating. 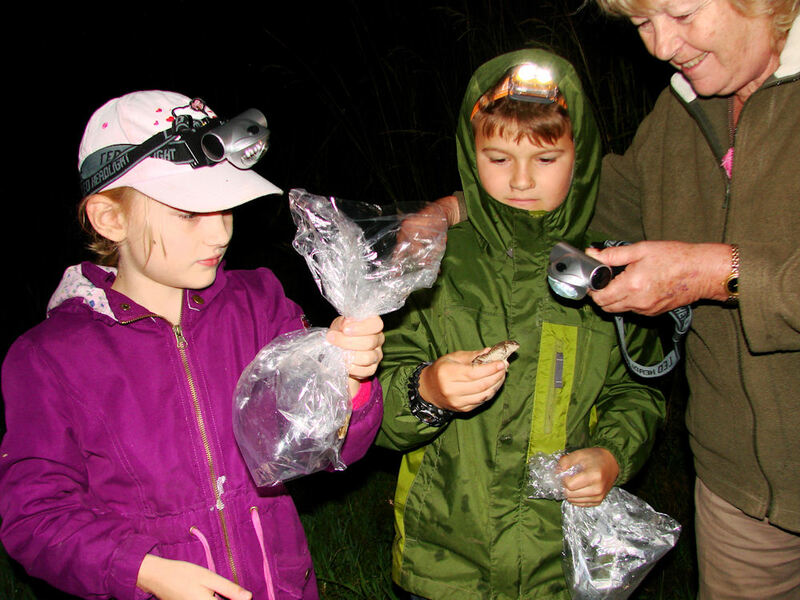 ” Charlie McGillivray lead the way around the vlei so we could hear the real frogs. We identified six by their calls: Bronze Caco, Painted Reed Frog, Tinker Reed Frog, Guttural Toad, Platana and Yellow Striped River Frog. Much splashing about and shining of torches followed. 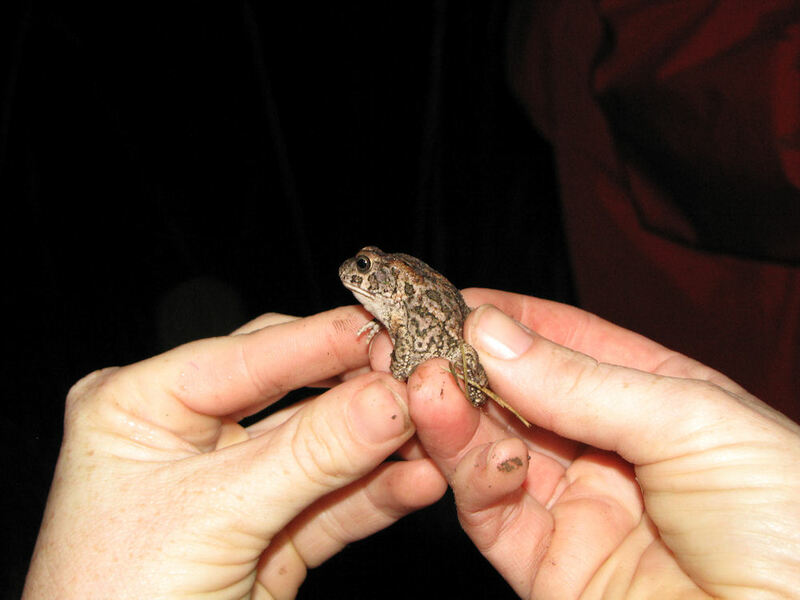 The first frog we caught was a Guttural Toad. We also found a number of pretty little Painted Reed Frogs. Their markings are completely different in different areas of the coutry which causes confusion. They also fade in sunlight, probably as a defence against the sun. We popped what we caught into plastic bags to observe them for a while. As their skins are porous, they will absorb any substances we had on our hands and we didn’t want to harm them. John held this one gently by it’s pelvis so we could all have a look before it leapt away. Zoe tried to photograph hers in the plastic bag. 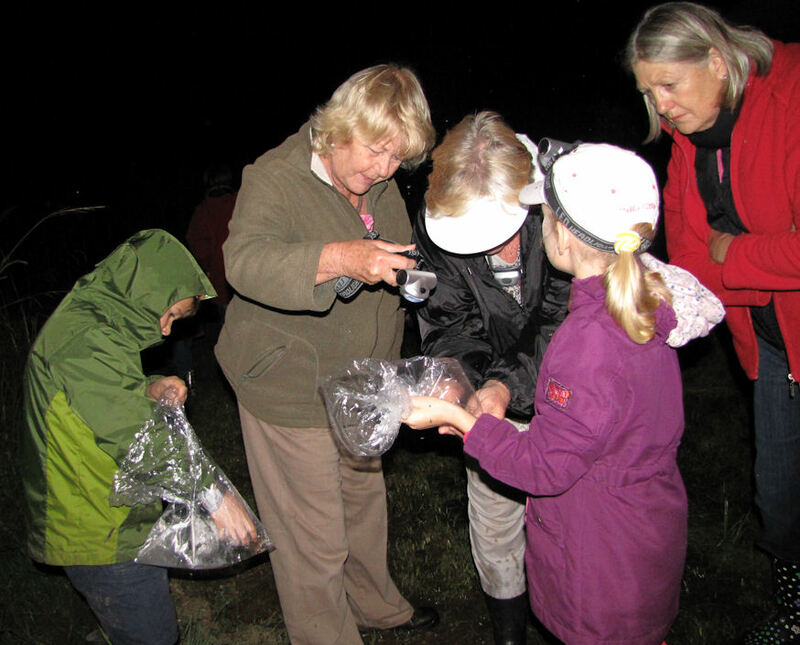 The children were definitely the best at finding and catching the frogs! We also caught a Tinker Reedfrog and a Yellow Striped River frog. Great fun was had by all. 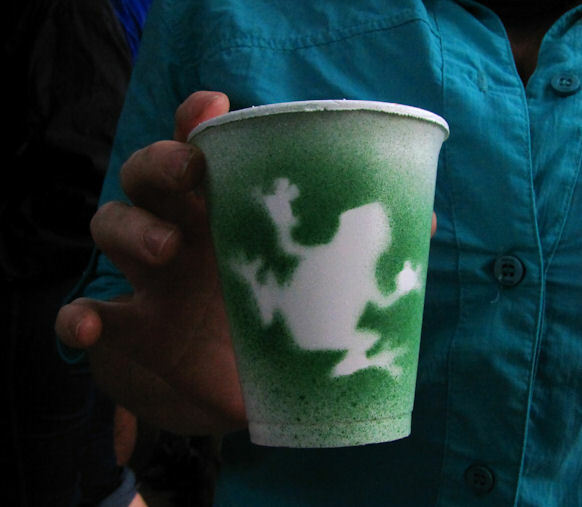 We headed back for coffee in frog themed cups which Twane Clarke had created especially for the occasion, and a braai at the Nick Steele picnic site. This entry was posted in Environmental Learning, Some Friends Hop and Slither and tagged Charlene Russell, frogs, gumboots, Guttural Toad, karkloof, Karkloof Conservation Centre, wetlands on February 2, 2013 by Midlands Conservancies Forum.